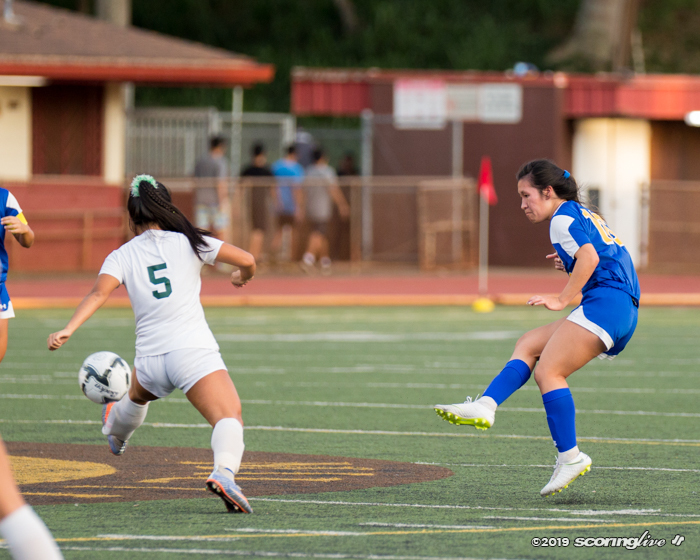 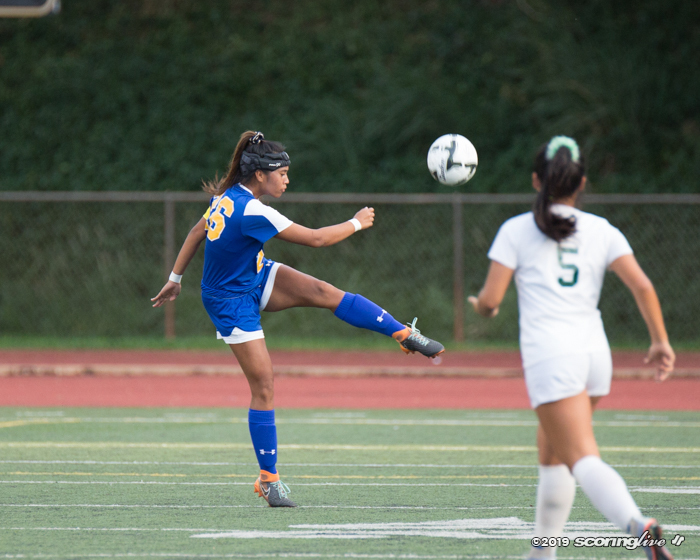 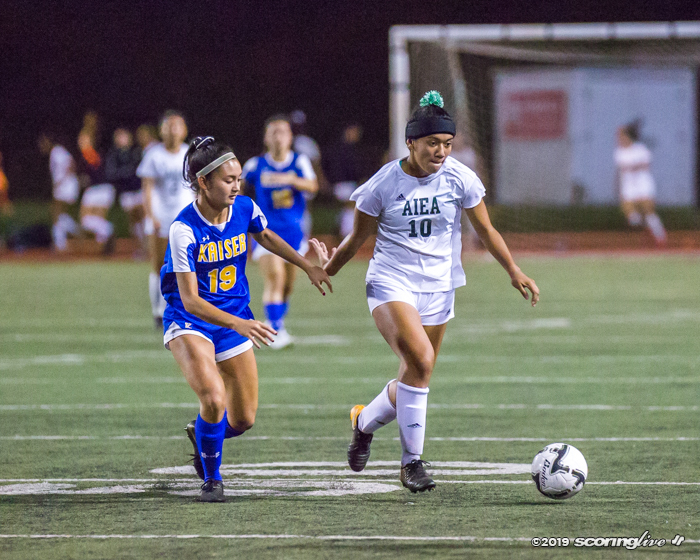 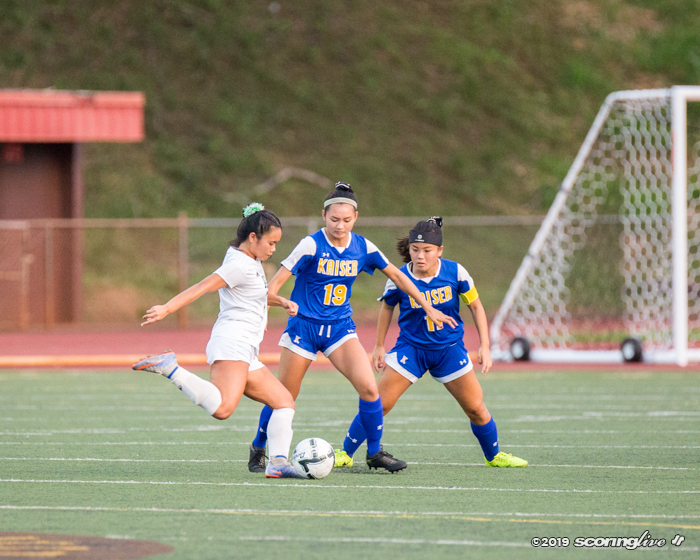 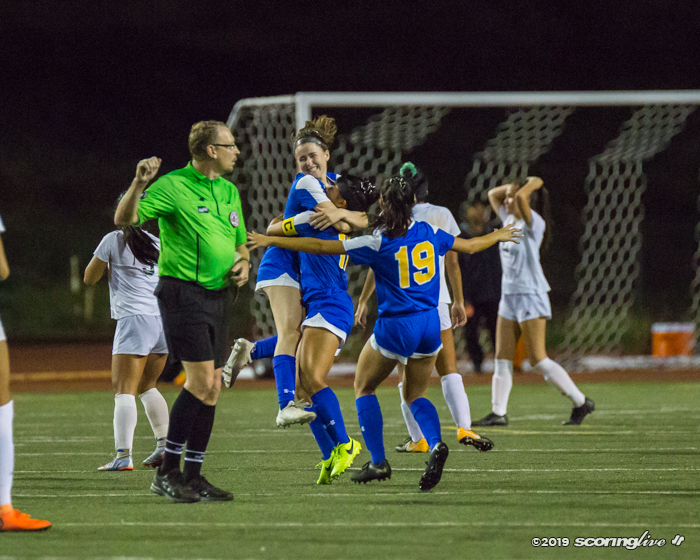 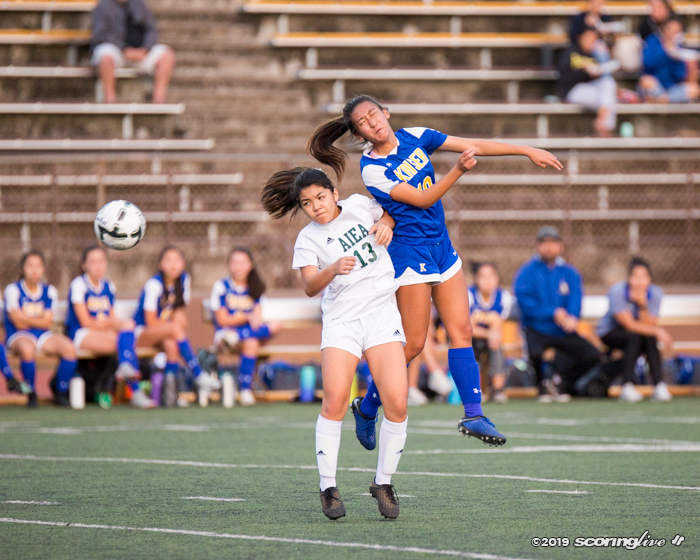 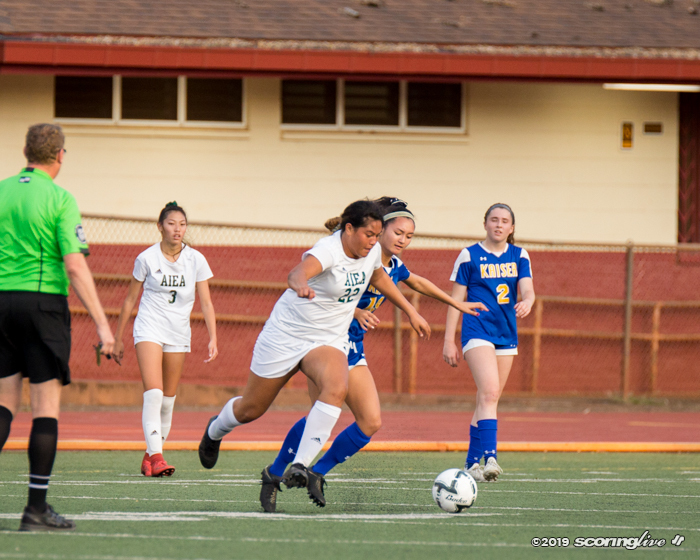 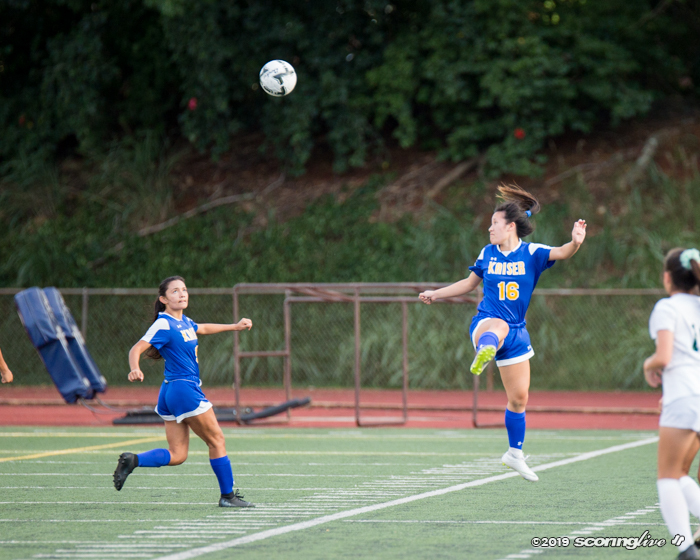 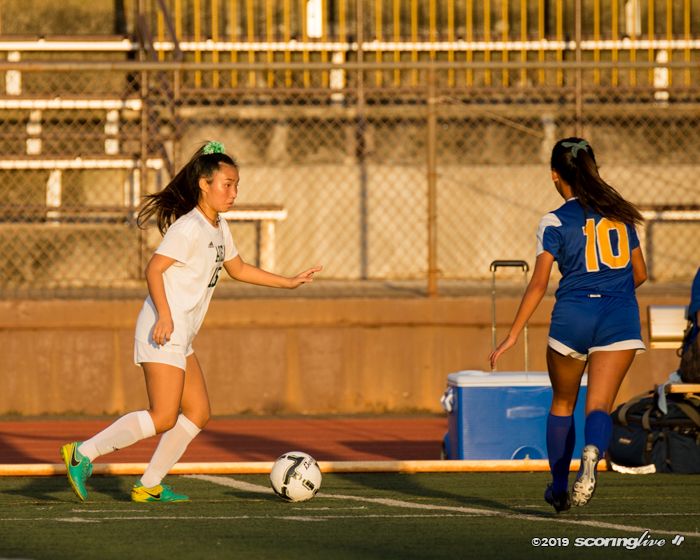 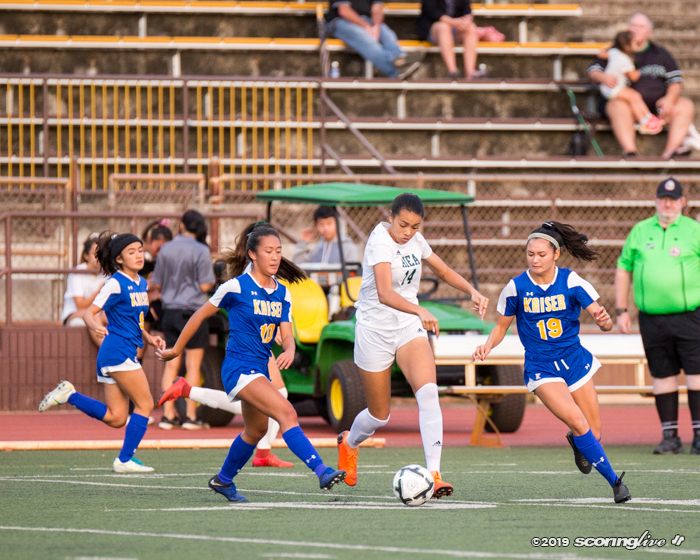 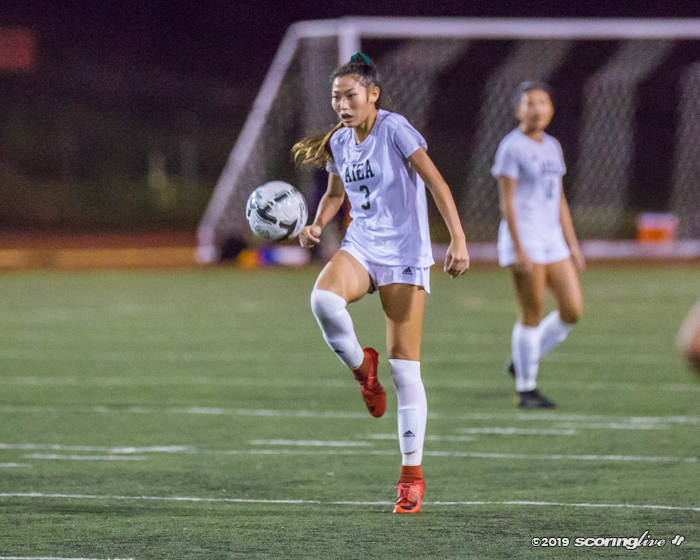 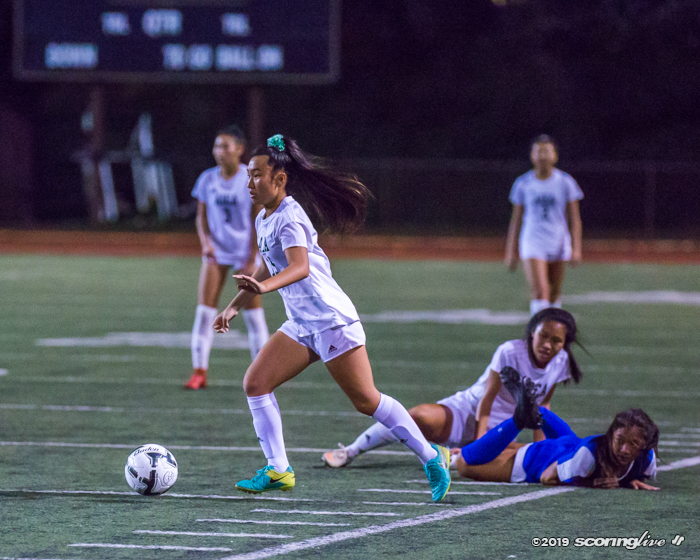 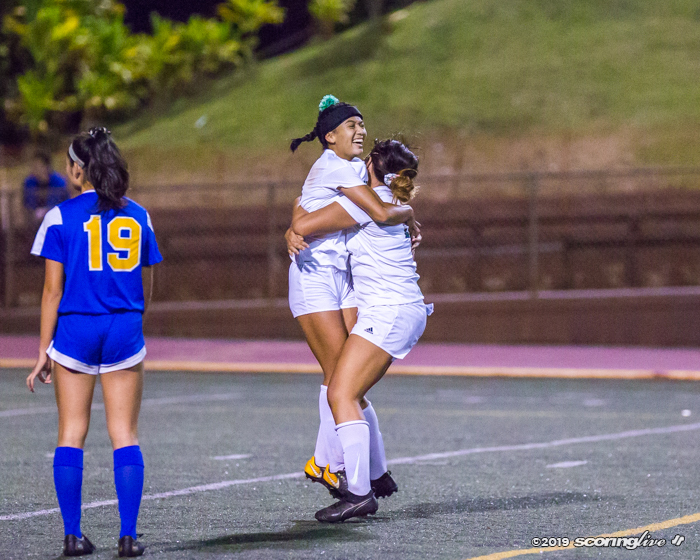 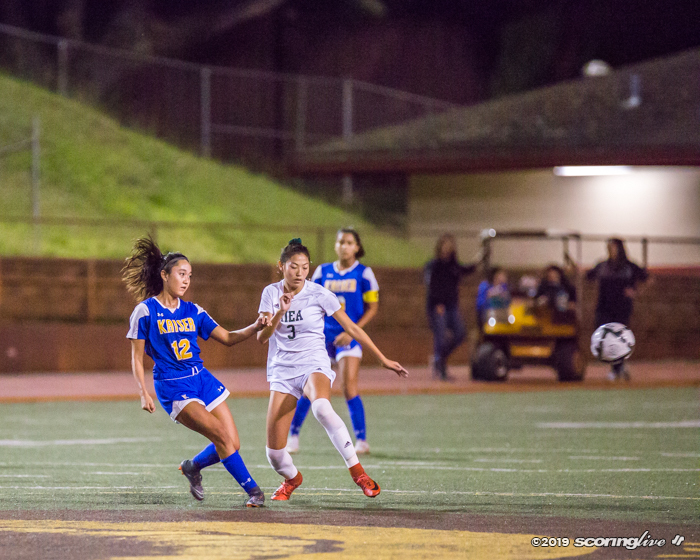 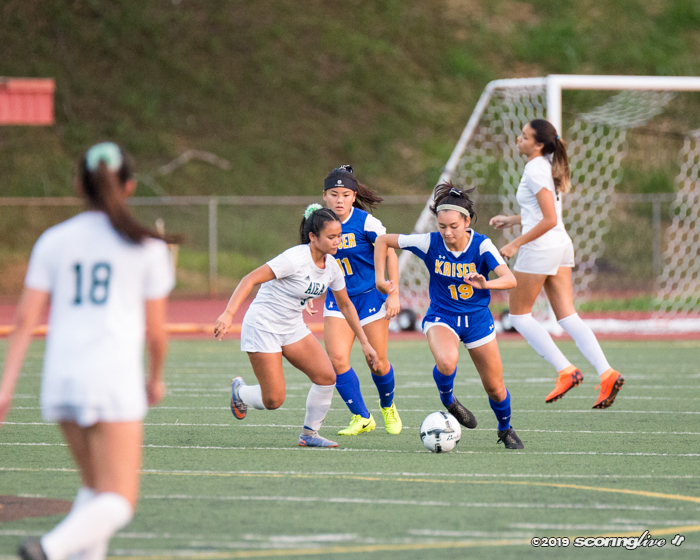 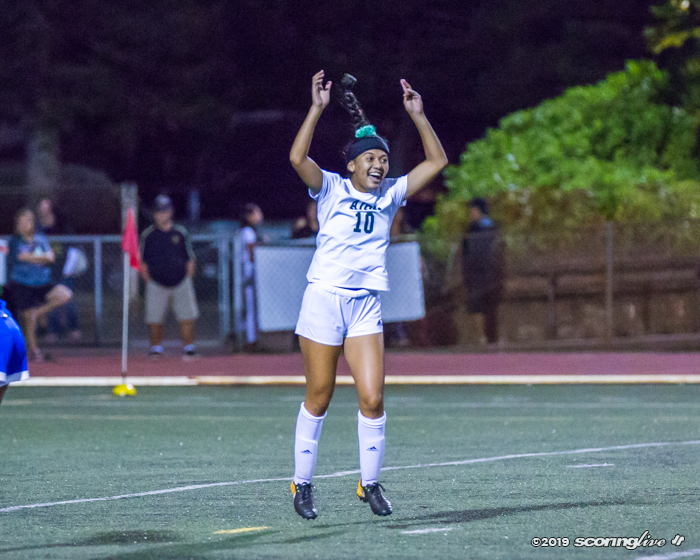 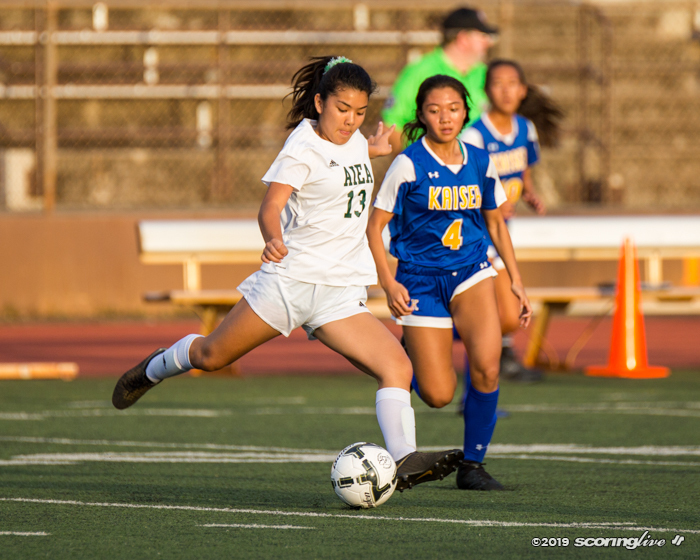 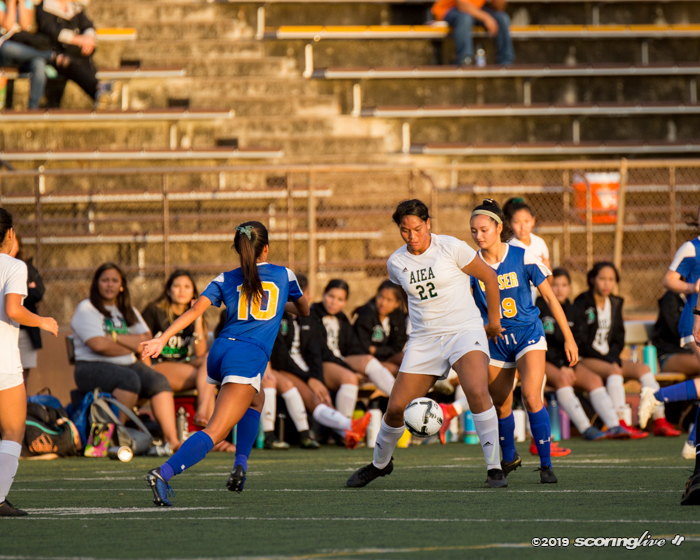 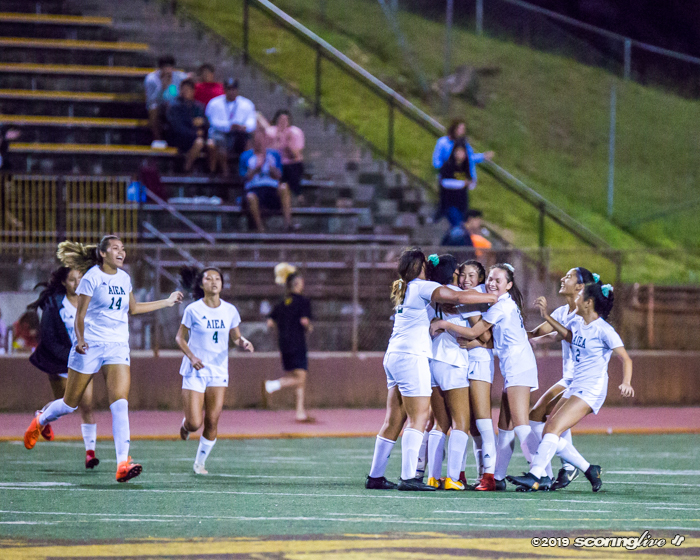 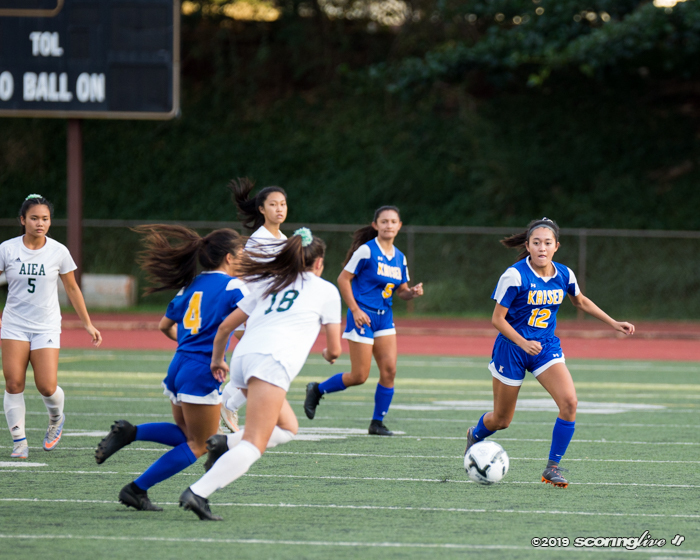 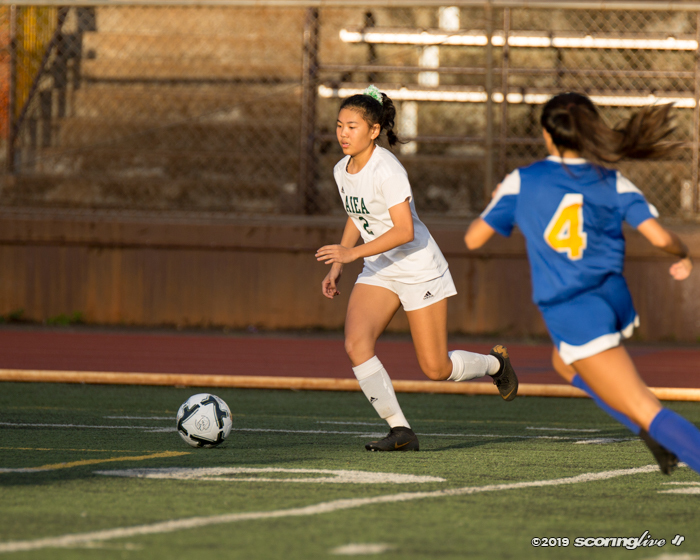 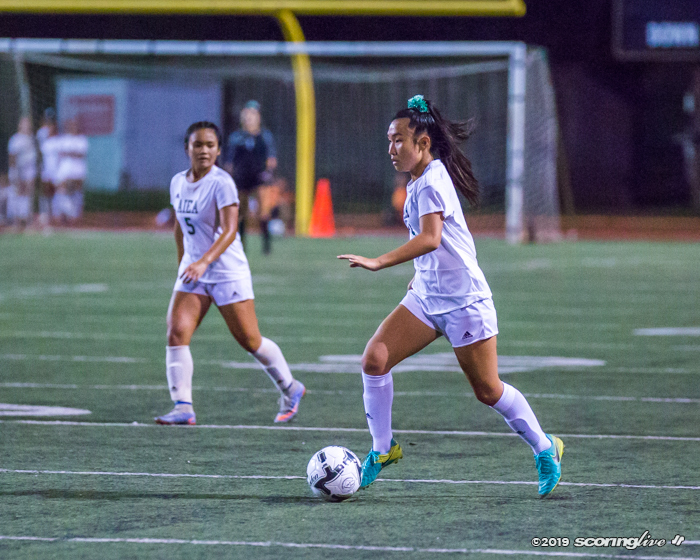 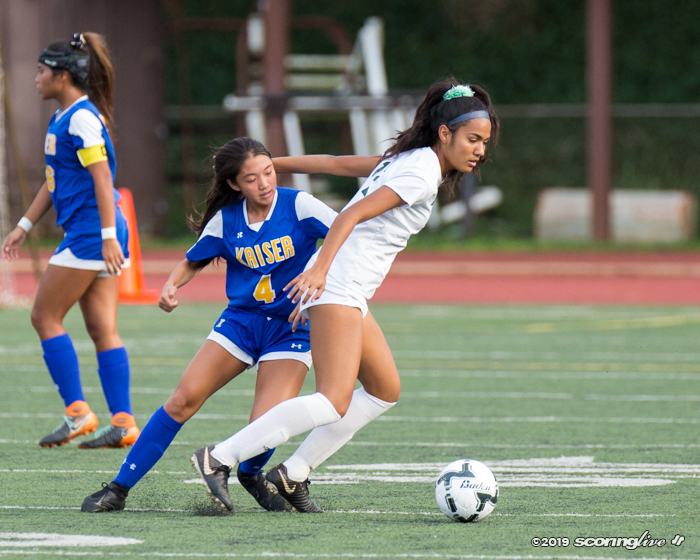 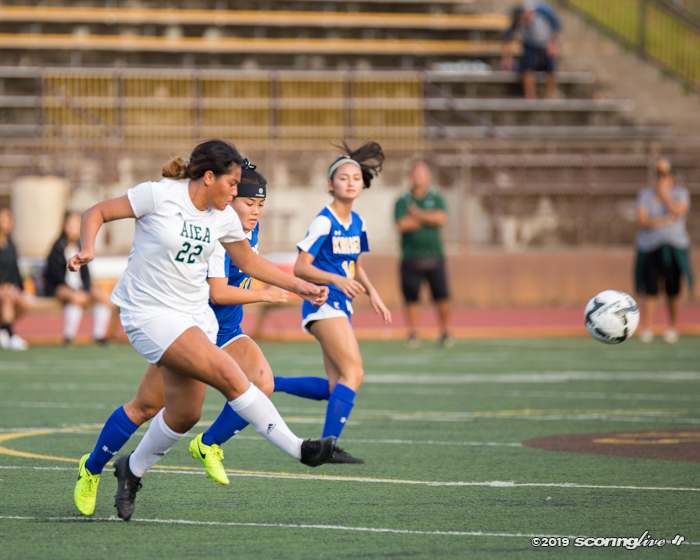 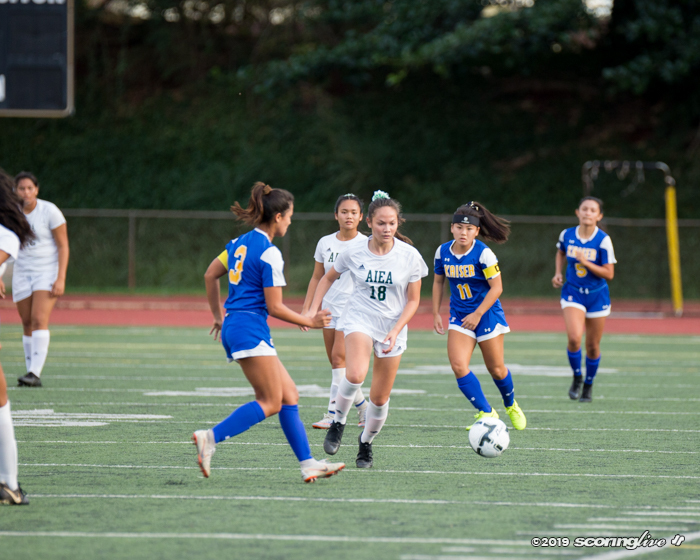 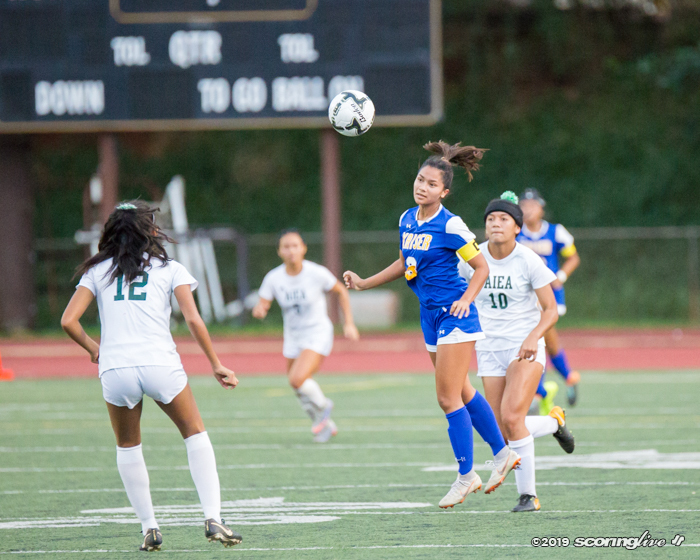 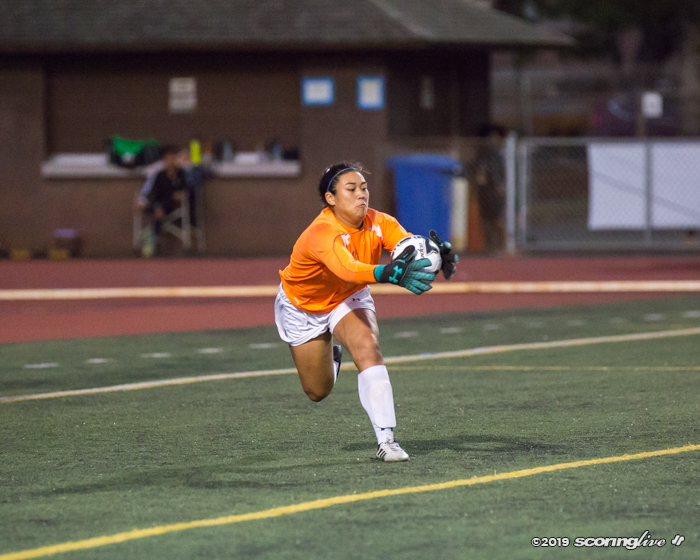 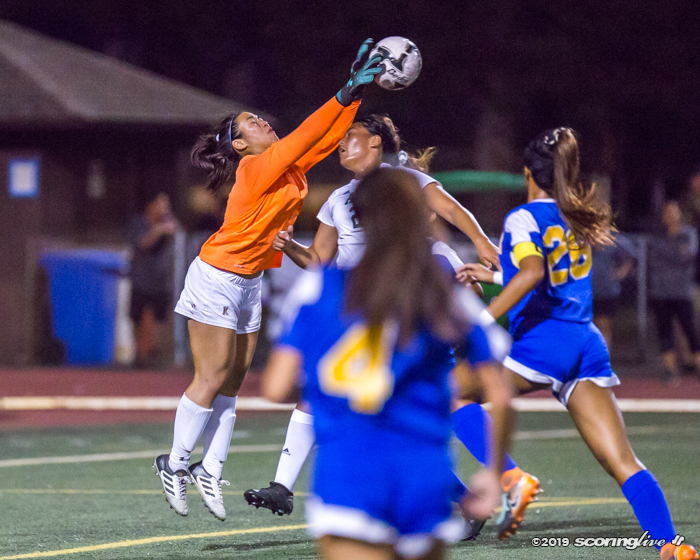 MILILANI — The Aiea girls soccer team got its redemption against Kaiser Tuesday night. 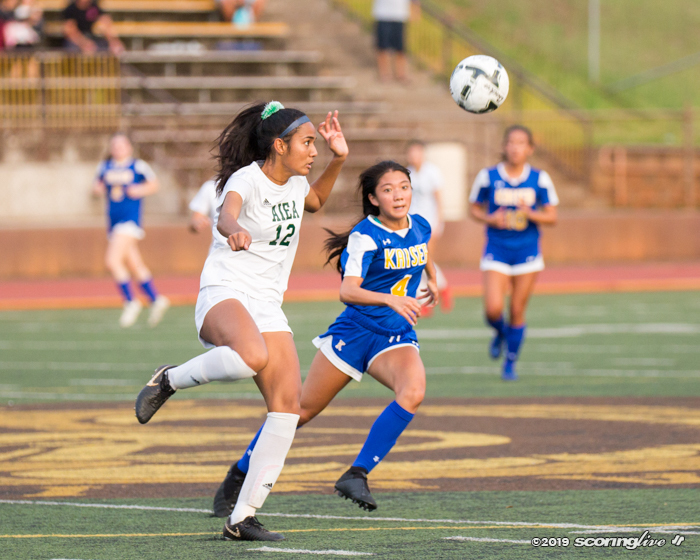 Savannah Breeze Miranda netted a pair of second-half goals to help Na Alii rally to a 2-1 win over the Cougars in a quarterfinal of the Oahu Interscholastic Association Division I tournament at John Kauinana Stadium. 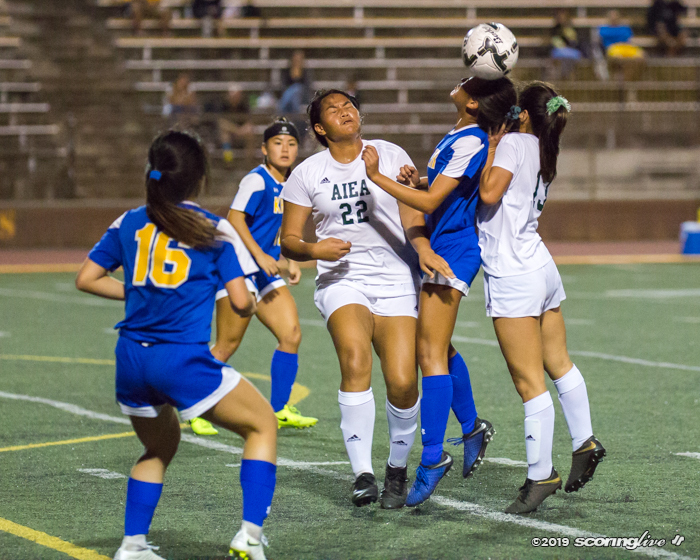 Aiea, the No. 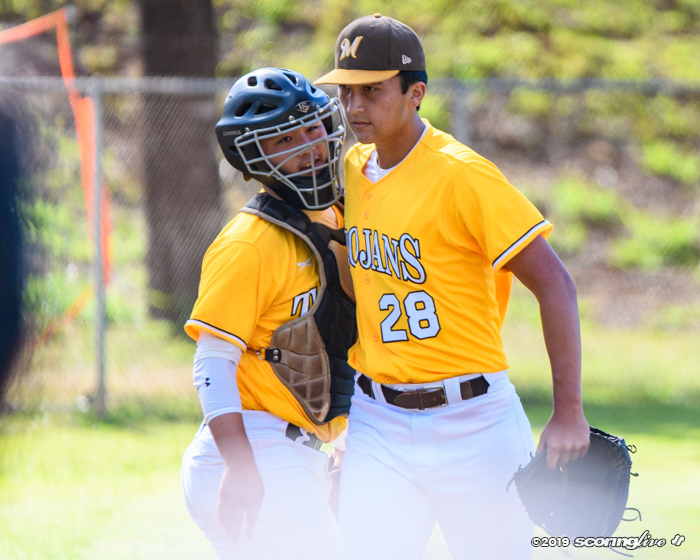 7 team in the ScoringLive/Hawaiian Electric Power Rankings and the third seed out of the Western Division, improved to 10-2 on the season. 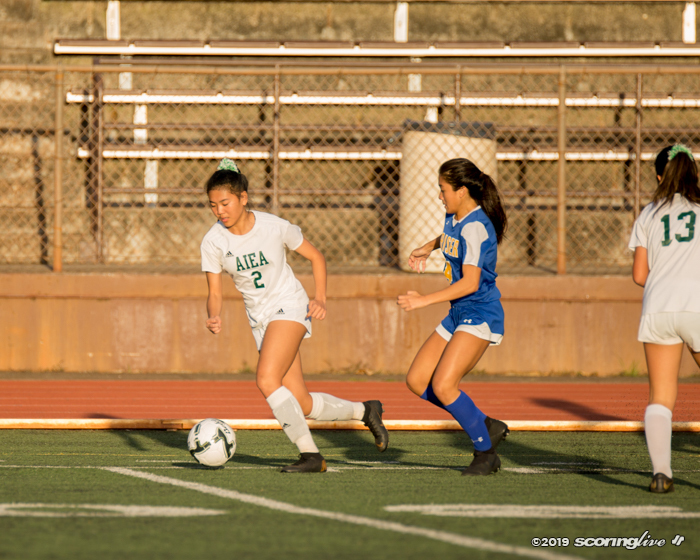 With the victory, it also secured a spot in Thursday night's league semifinals and a spot in the state tournament in two weeks. 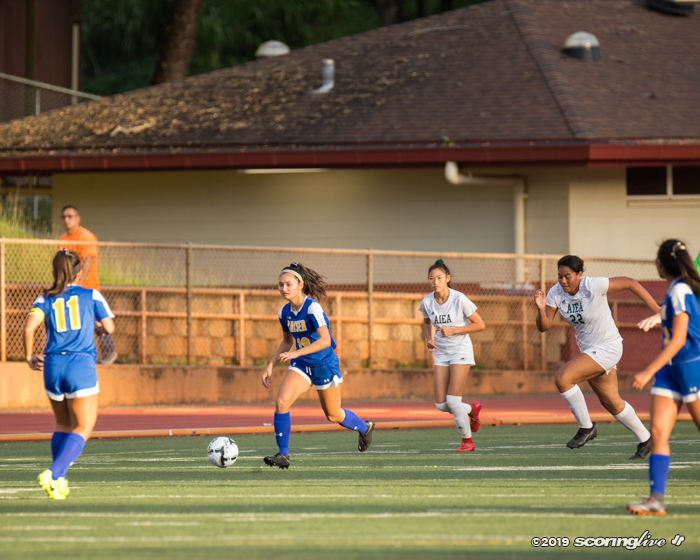 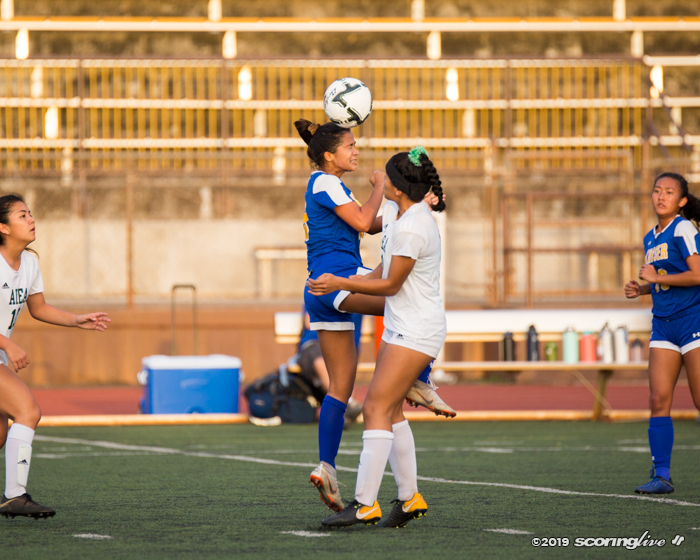 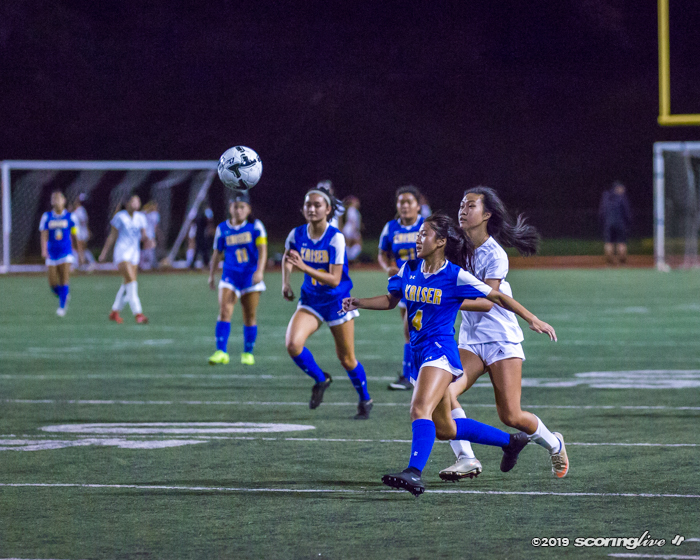 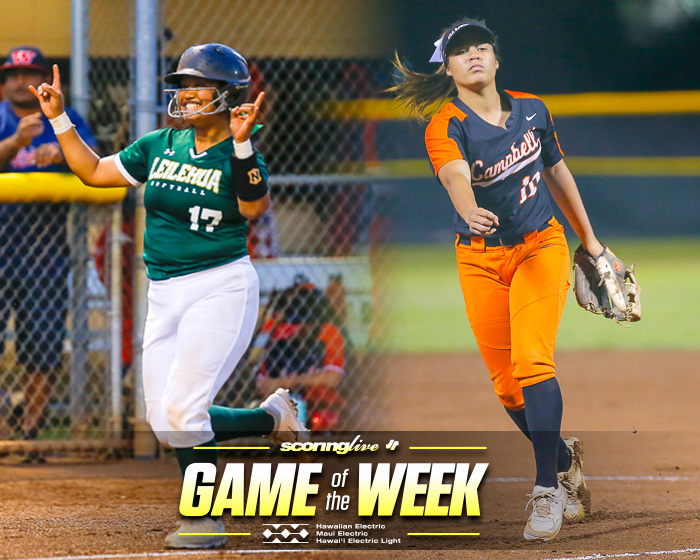 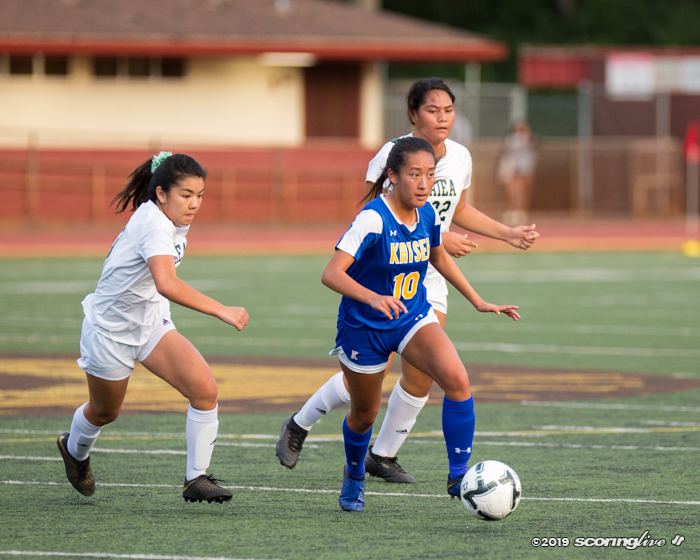 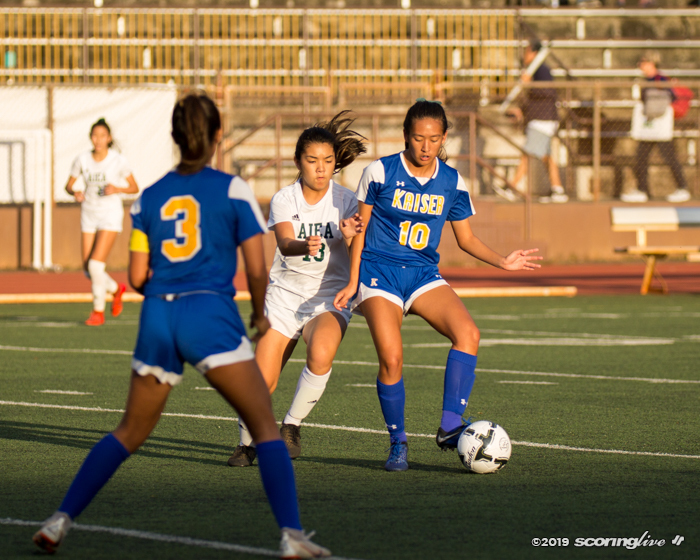 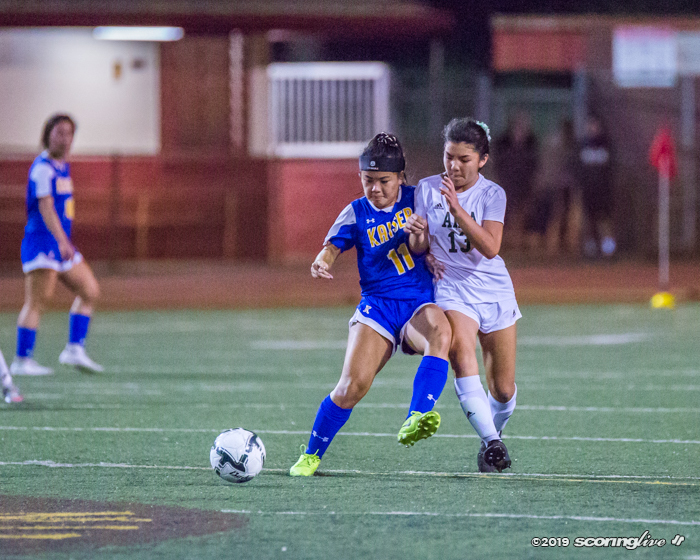 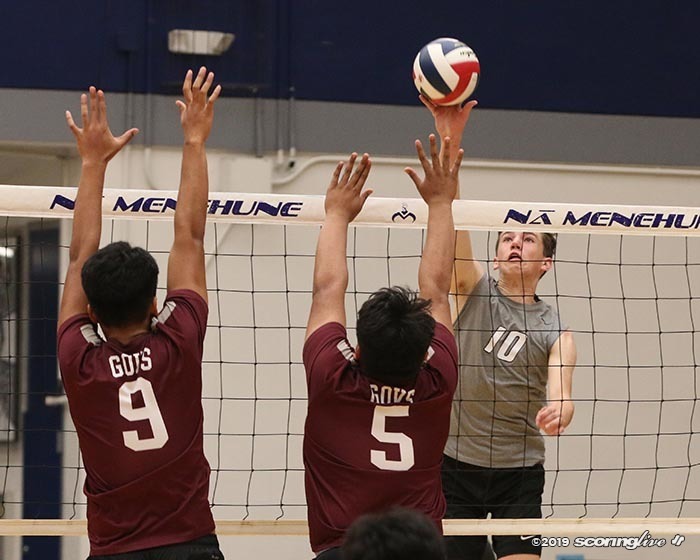 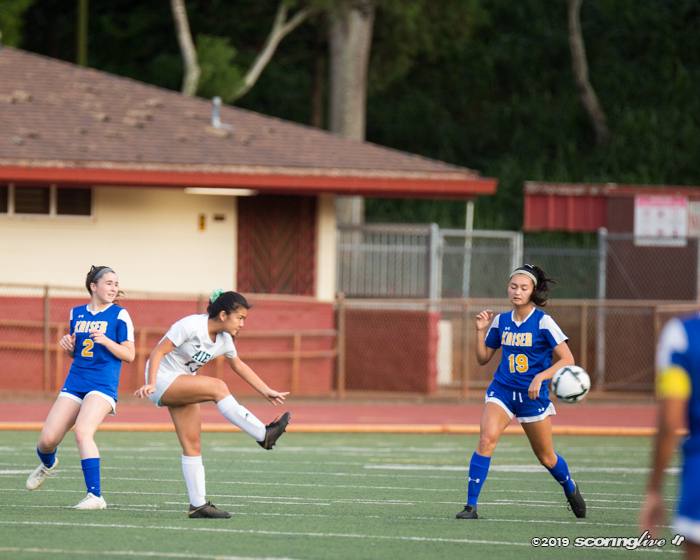 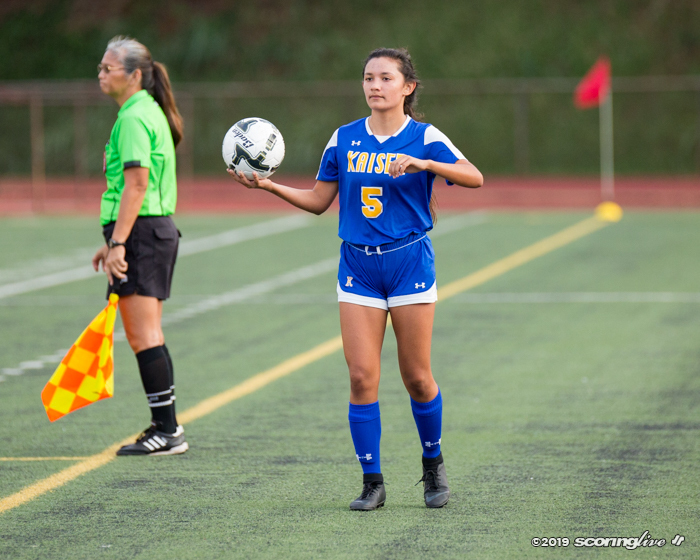 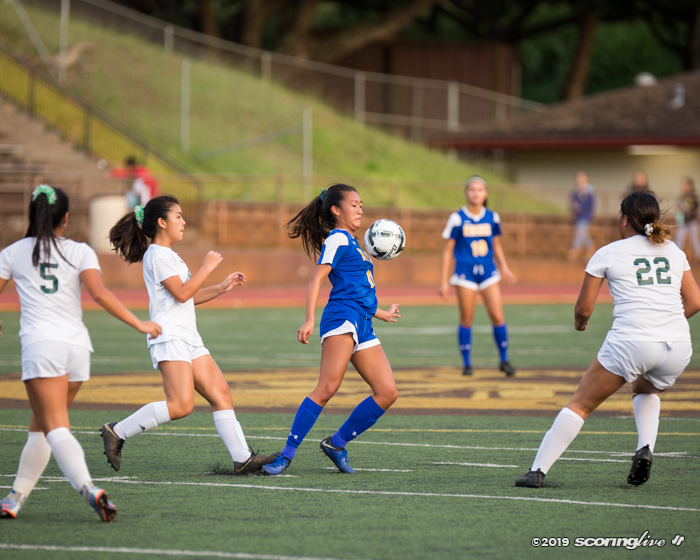 Na Alii will meet West top seed and third-ranked Mililani — which defeated West fifth seed Campbell 2-1 (OT) in a late quarterfinal — at 5:30 p.m. Thursday at Kaiser. 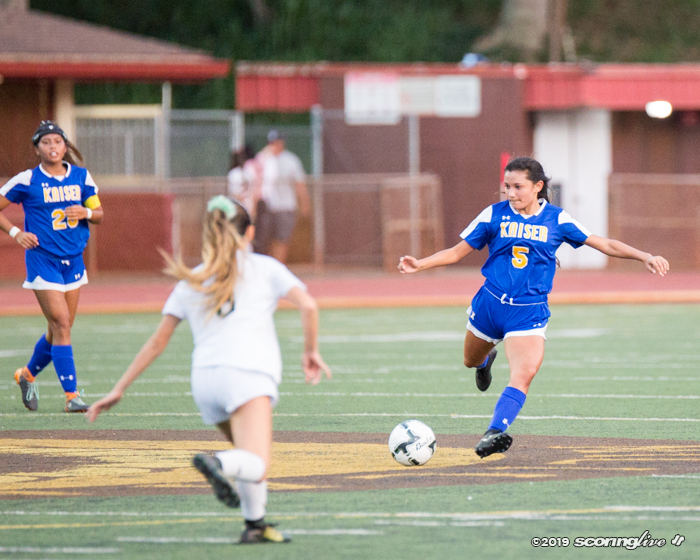 Eighth-ranked Kaiser, the East No. 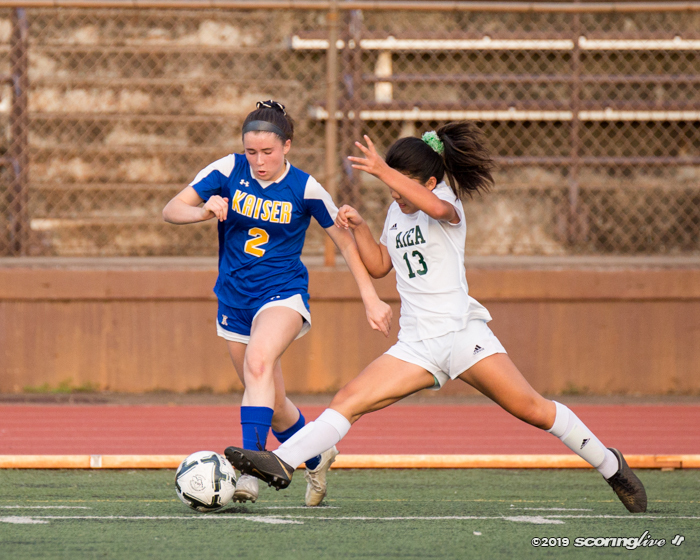 2 seed, saw its three-game win streak come to an end and fell to 8-2. 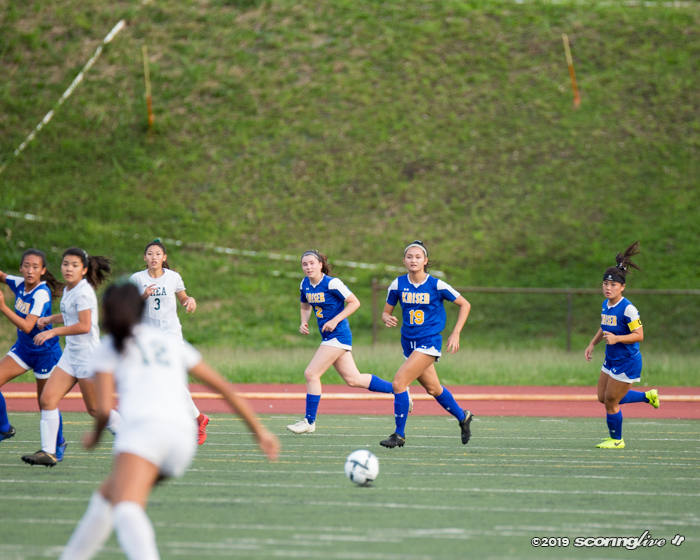 It will play the Sabers in a fifth-place semifinal at Castle Wednesday with a spot in states up for grabs. 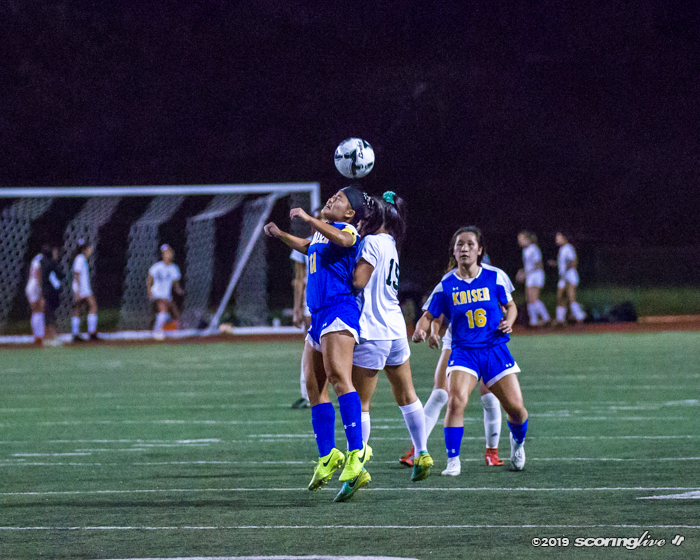 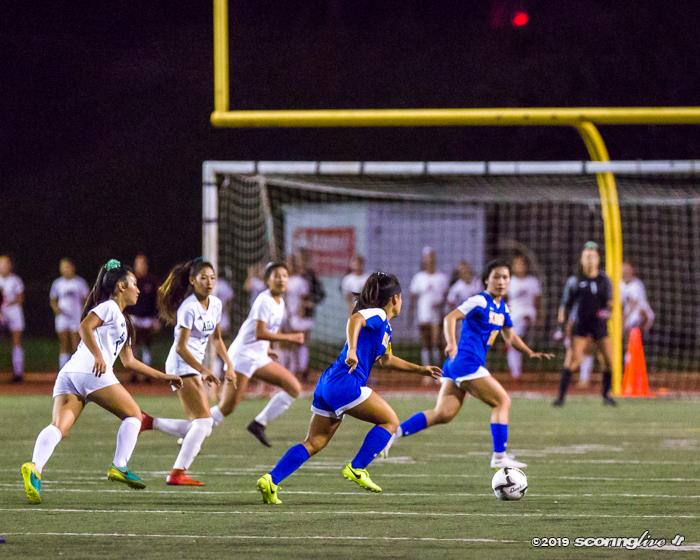 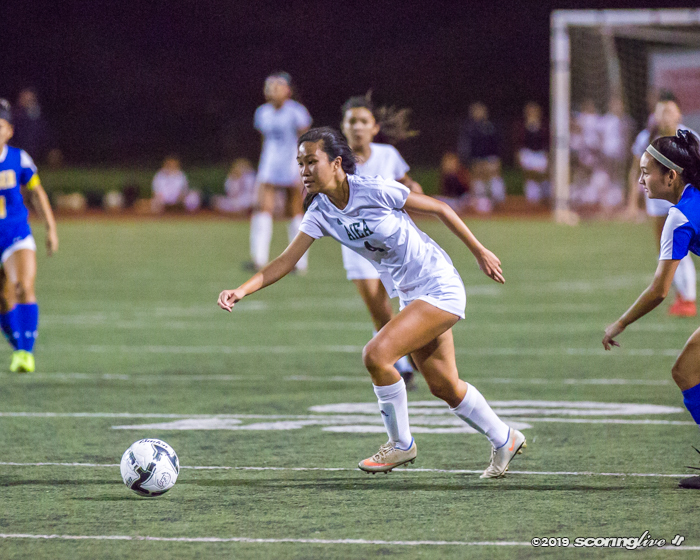 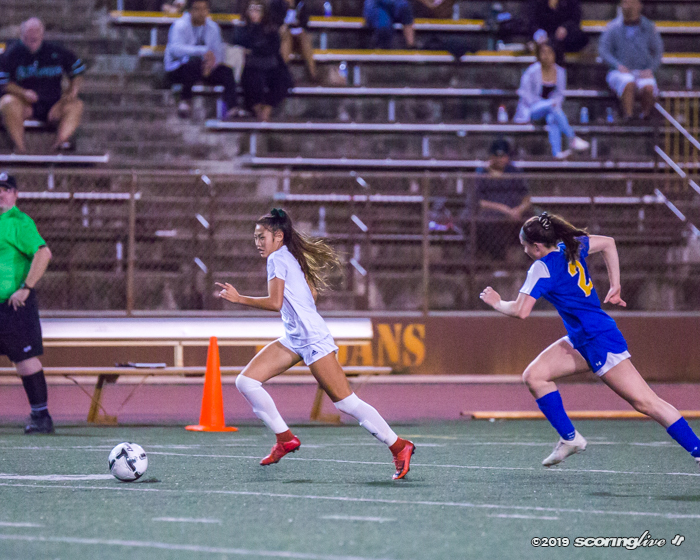 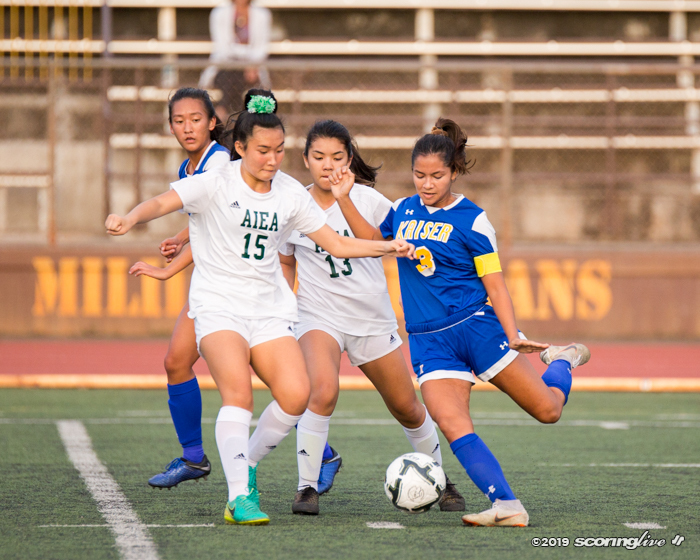 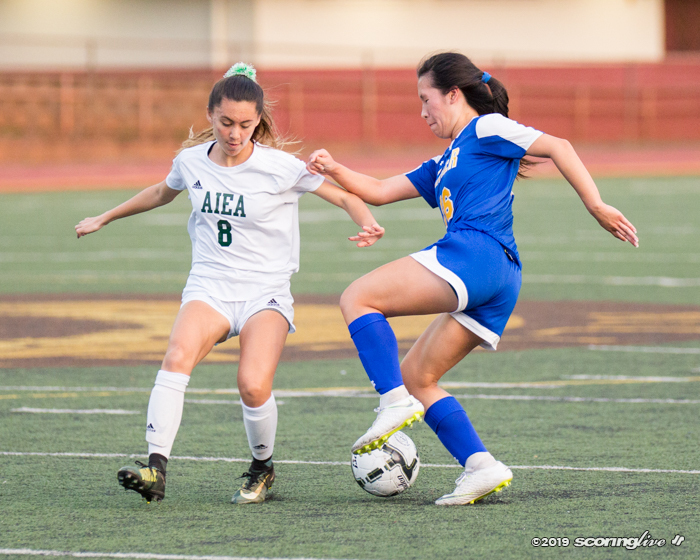 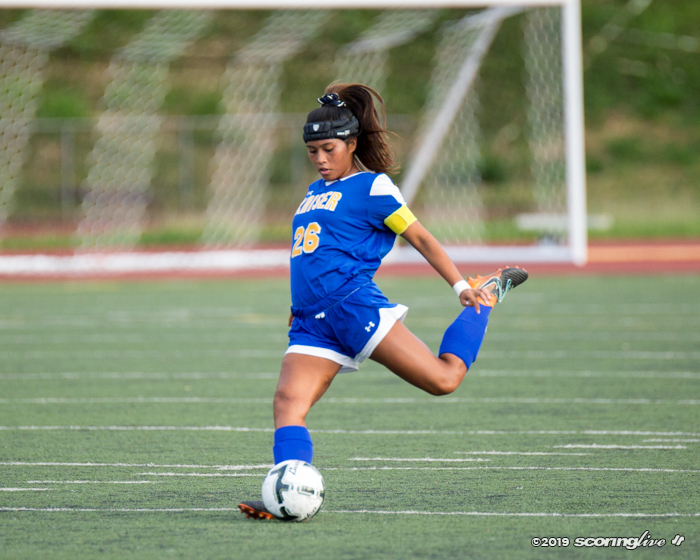 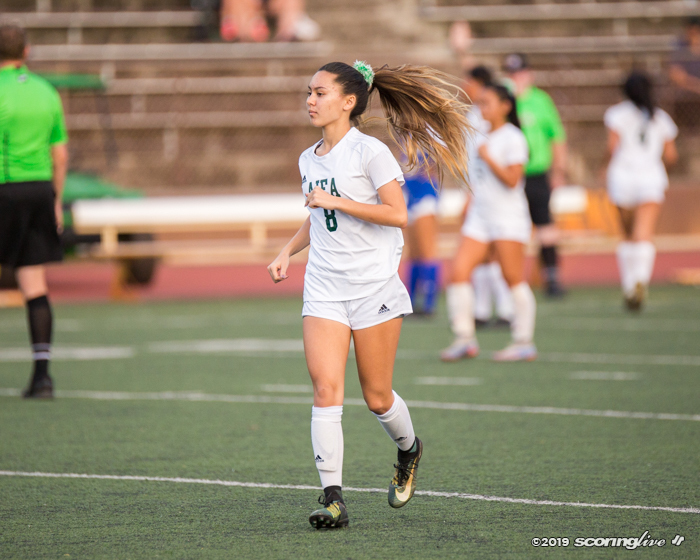 The Cougars handed Na Alii a pair of 1-0 defeats in the postseason last year — both in the league and state tournaments. 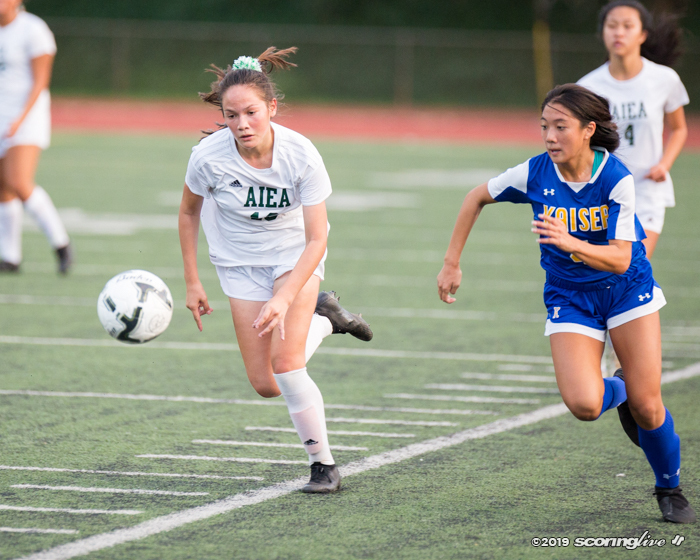 Those results were fresh on the minds of Aiea Tuesday night. 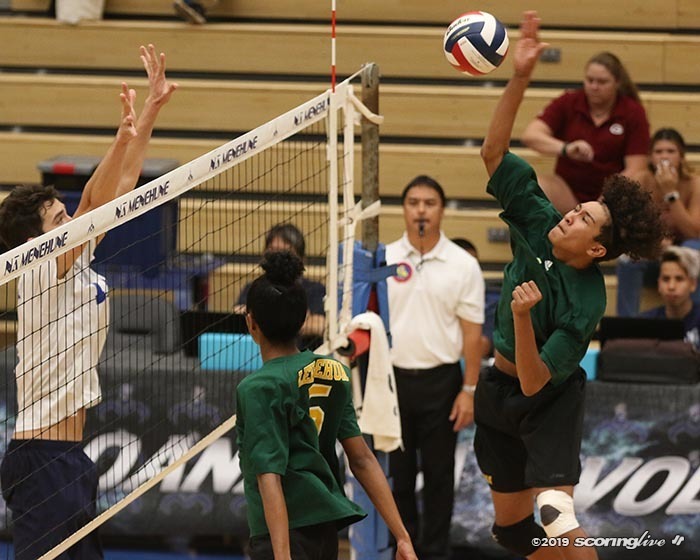 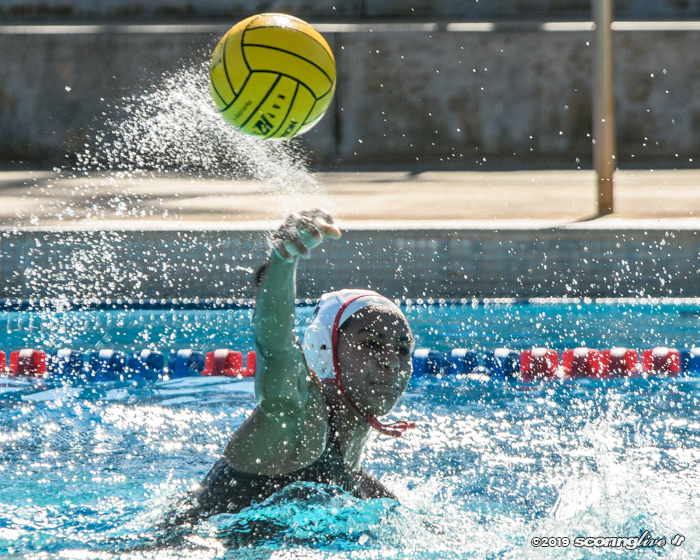 "They eliminated us twice last year, from OIAs and states, so this felt good," Na Alii coach Benji Villaflor said. 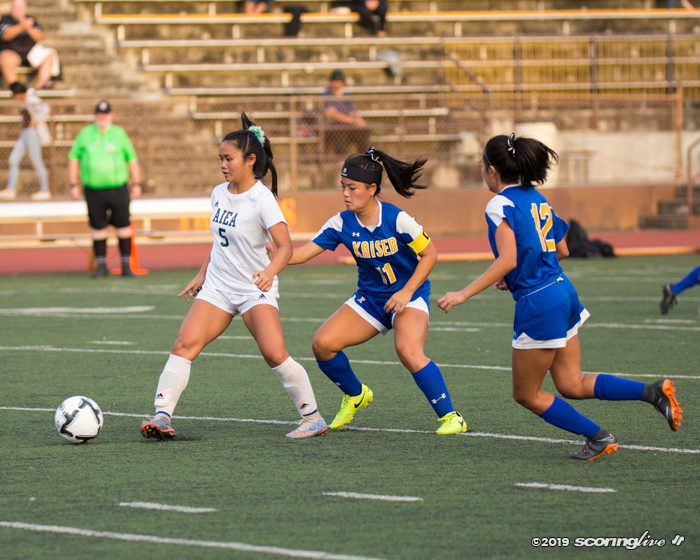 "We knew it was gonna be a tough game, but it was strictly a team effort. 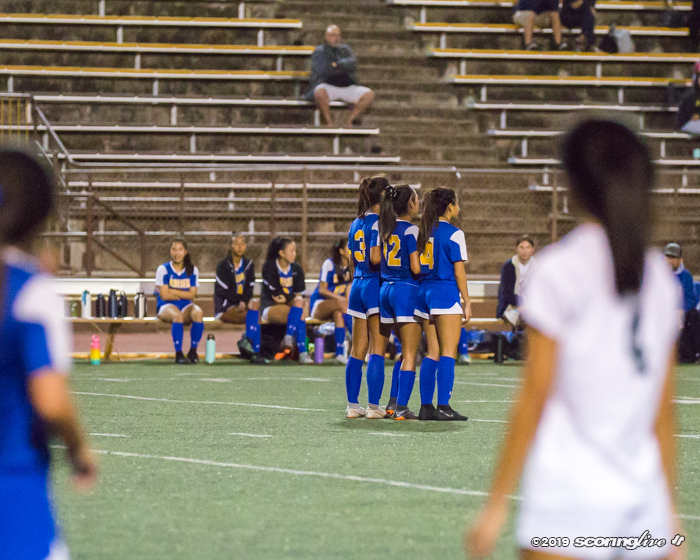 Our girls came together and they're jelling right now, right when we want them to." 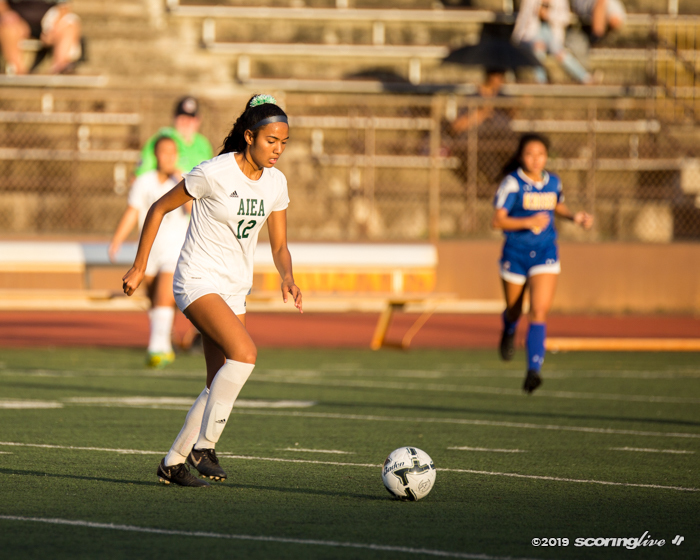 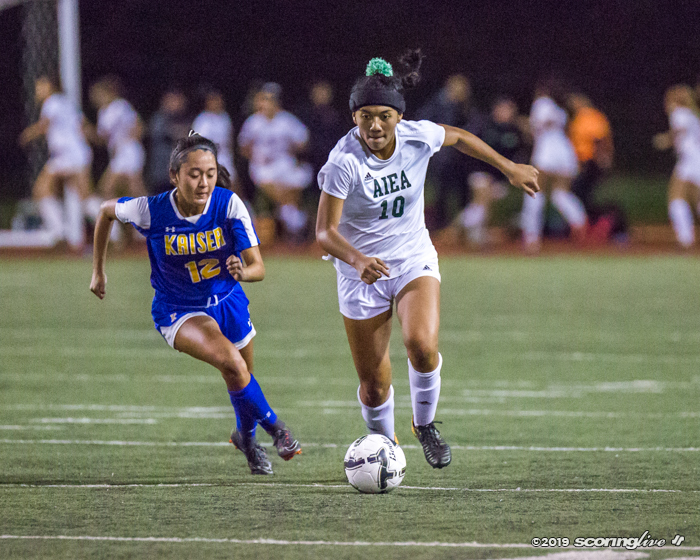 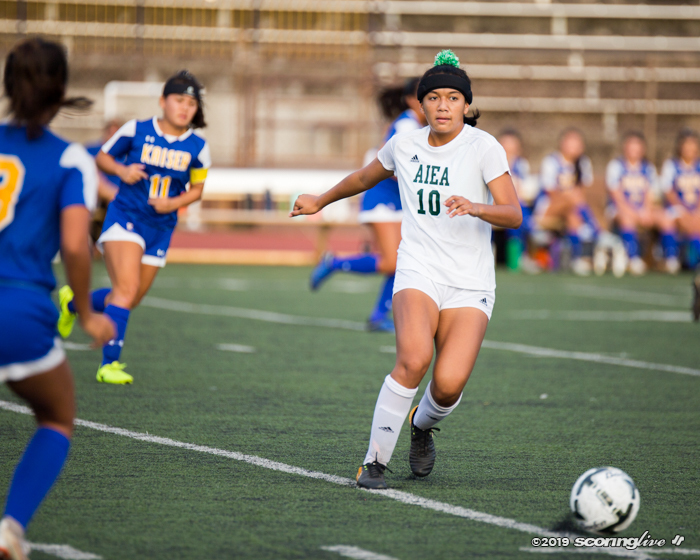 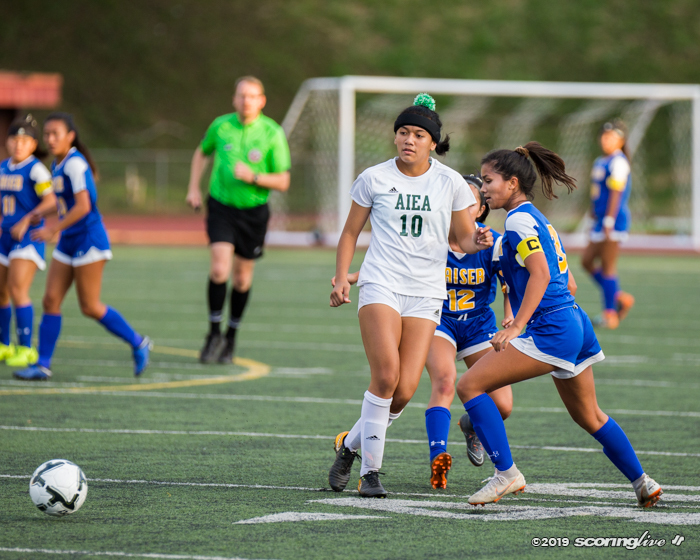 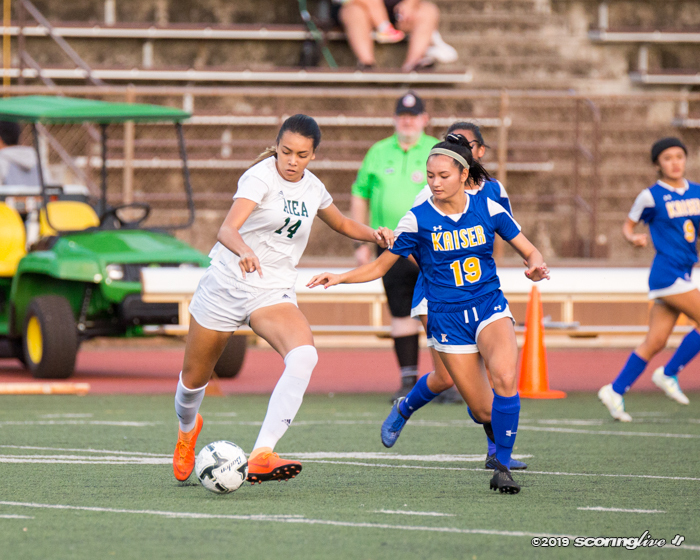 Aiea played without its leading goal scorer in Sheyliene Patolo, who was injured in Monday night's 2-0 first-round win over Kahuku. 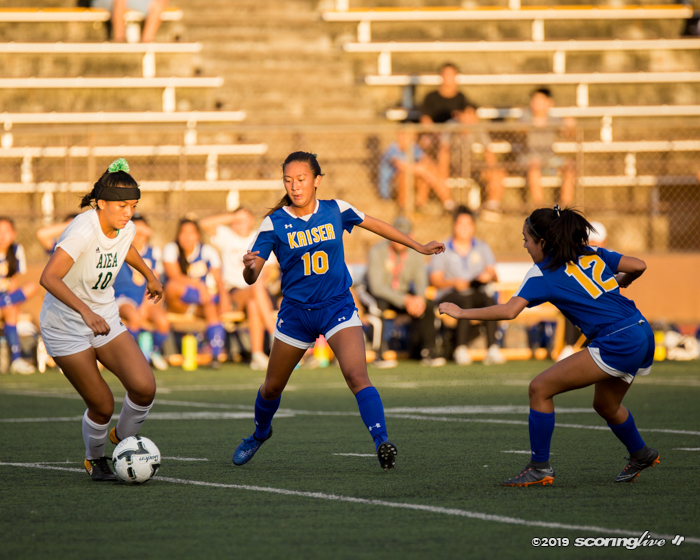 Kaira Ringen started in Patolo's place in the midfield. 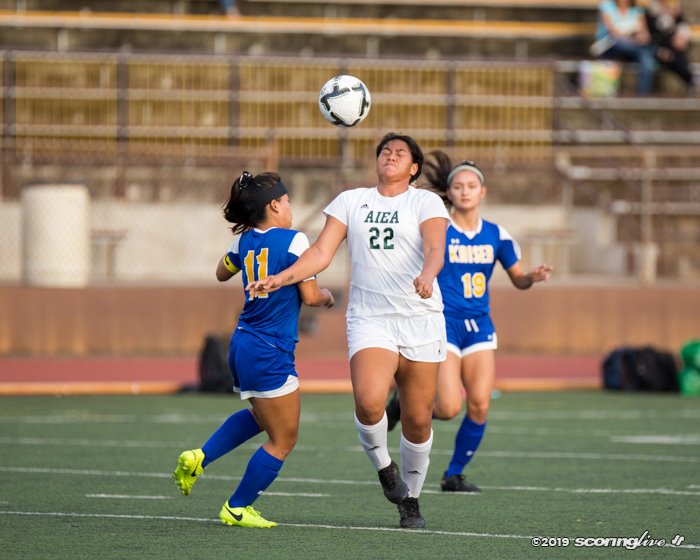 "Usually we play a possession game, but we did what we had to do to work. 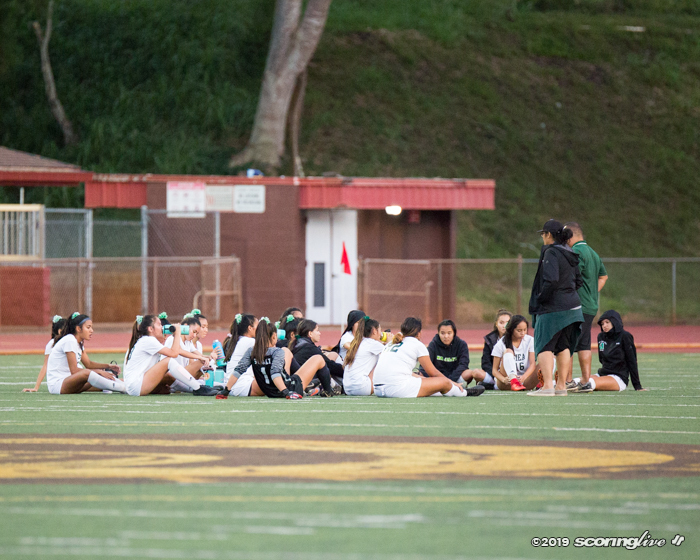 It was kind of ugly, but the main thing was we fought through, pushed through. 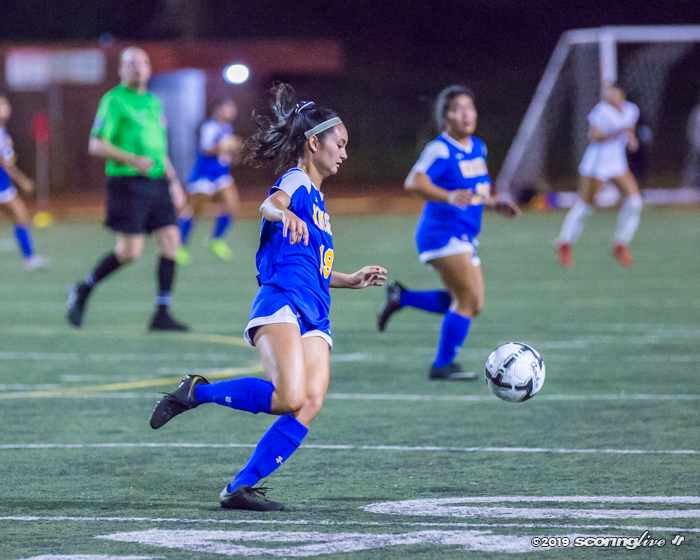 We were suffering from a couple of injuries, but it's just amazing to be able to come back and avenge those two losses," Villaflor said. 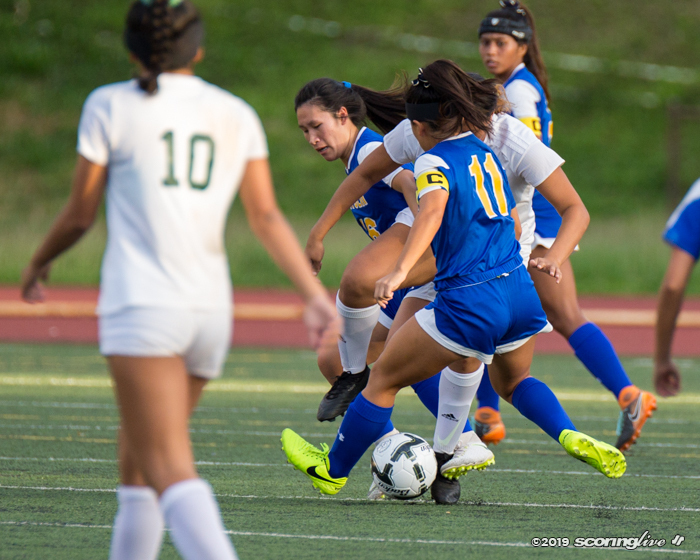 Nicole Olanda, who assisted on both Miranda goals Tuesday, said it took a collective effort to overcome the loss of Patolo. 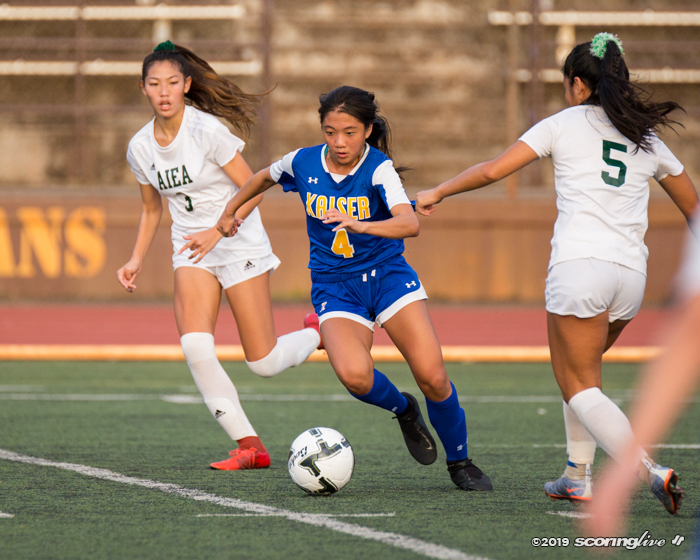 "She was a big loss for us because coming into this game we knew that they were gonna mark me from last year," Olanda said. 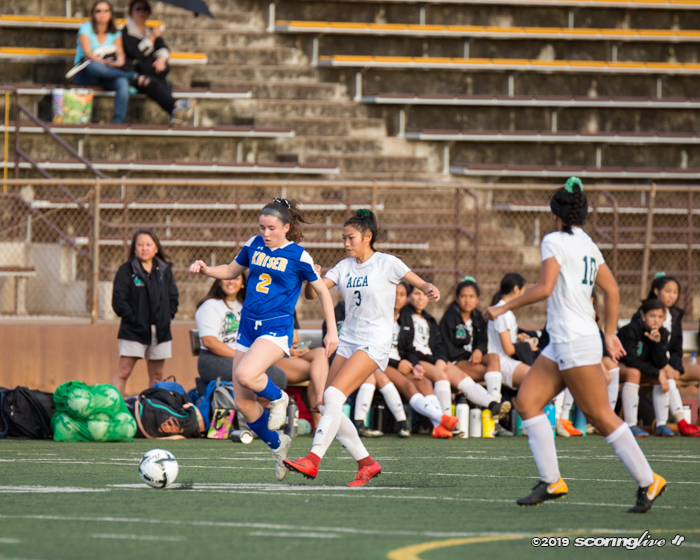 "She was on the other side, she was gonna be open all the time, but our players stepped up to fill her spot so she could recover and we got that W."
After more than 60 scoreless minutes, the Cougars took a brief lead on Madison Corso's first goal of the year. 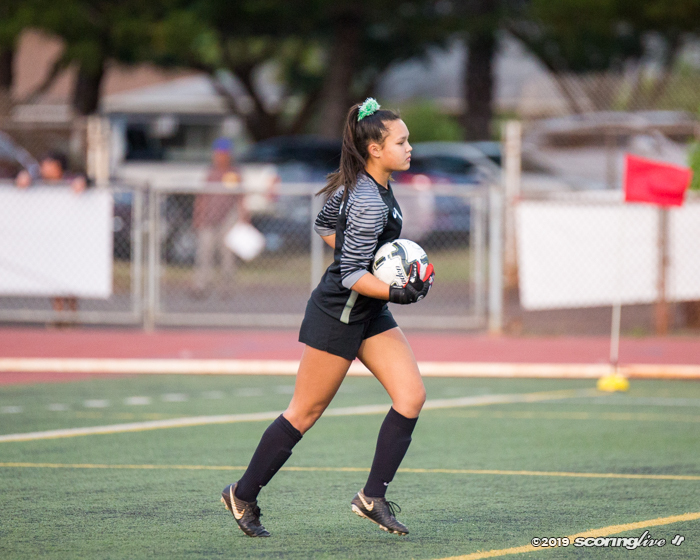 Corso booted a high-arching shot from the middle of the field, about 30 yards out that was out of the reach of Na Alii goalkeeper Shayla Sugai and found the upper left corner of the goal. 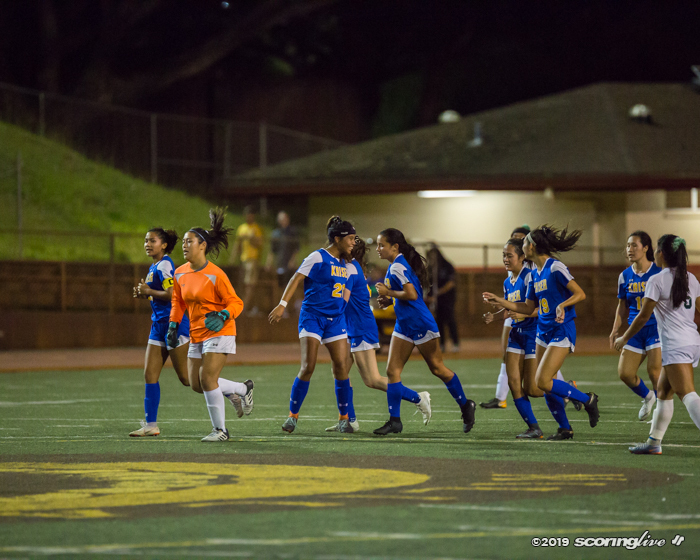 "When that goal happened we just had to not let it affect us and we just said ‘let it go, we can get it back, there's still time,' " Olanda said. 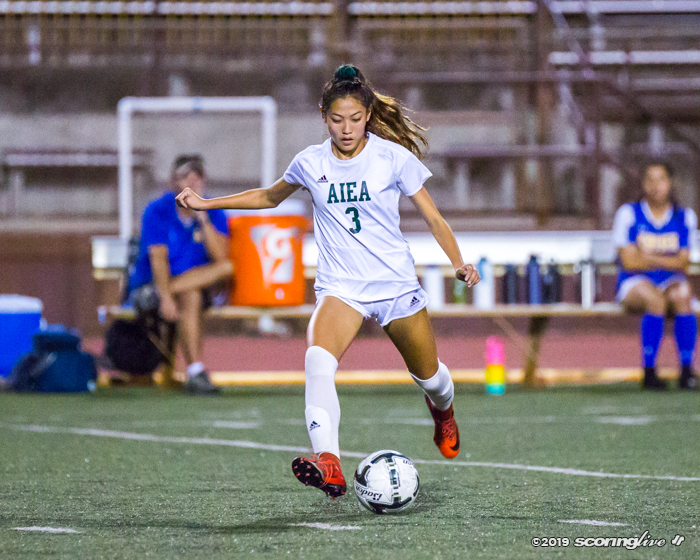 Aiea did not wait long to answer. 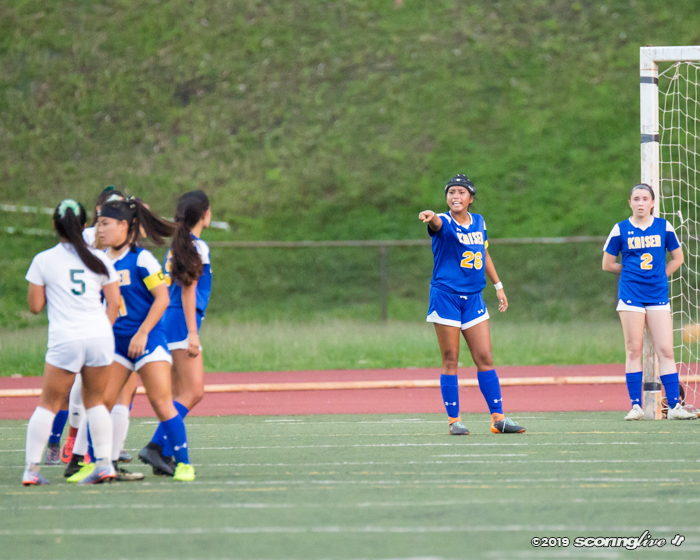 Just three minutes later, Miranda got behind Kaiser's back line and tracked down long pass from Olanda. 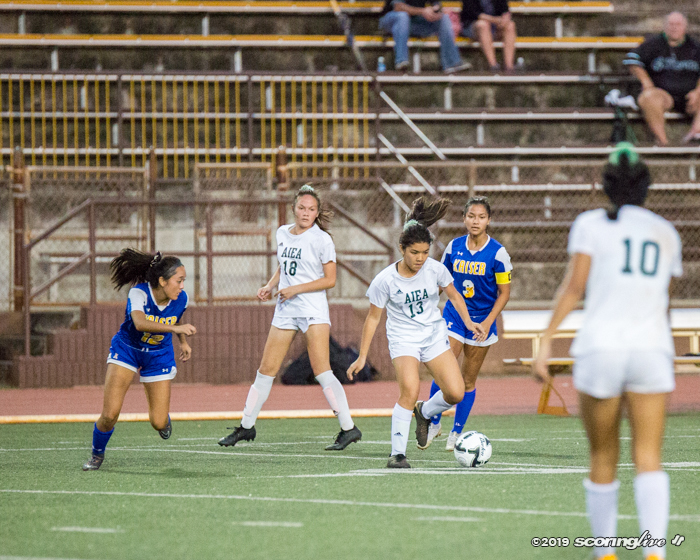 Miranda dribbled a few times toward the right post, cut back to her left to juke goalie Madison Mora, and pushed across an easy goal to equalize. 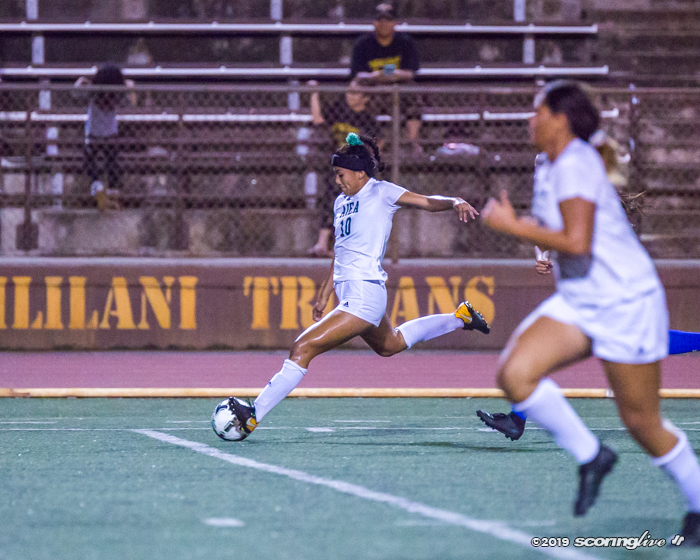 "When I was playing wing, I knew that long balls through over the defense would be in all the time because their back line is flat, so knowing Savannah was there, I knew she could get there, so I just played it and she got there and finished," Olanda said. 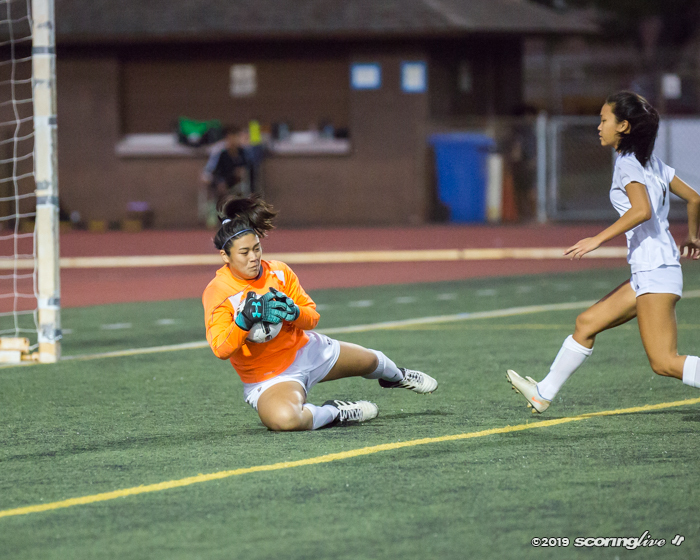 Miranda reminded herself to keep her composure just before making her cut. 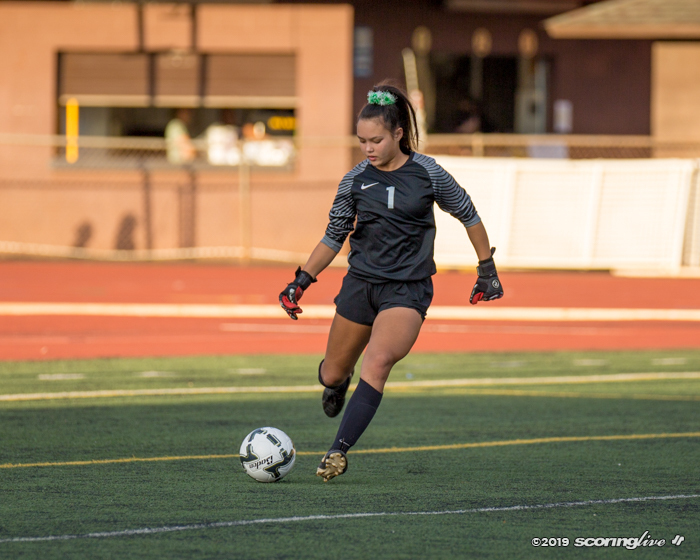 "I remember receiving the ball and then taking it and then the goalie coming out and I just remained calm and I just touched it to the side of her and took it in," Miranda said. 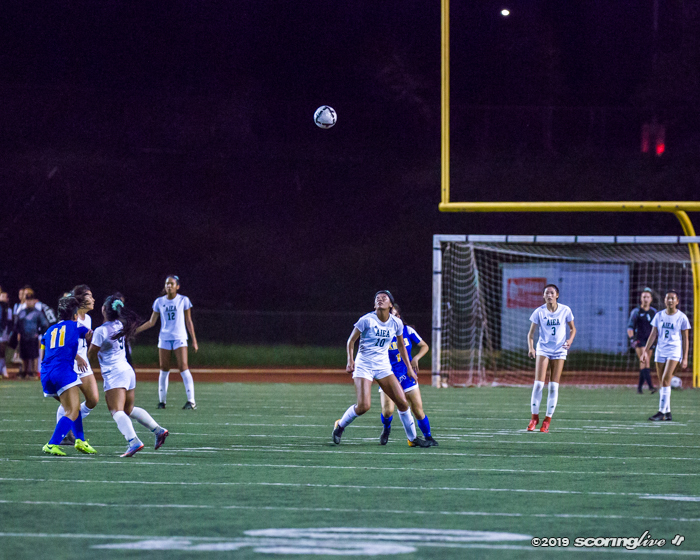 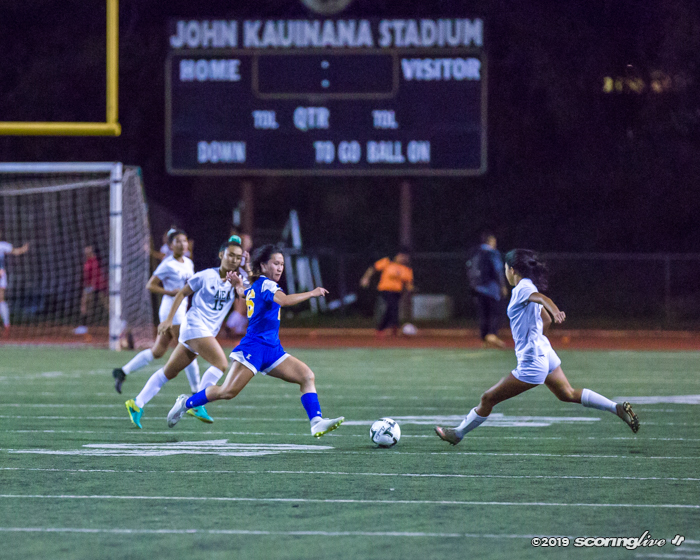 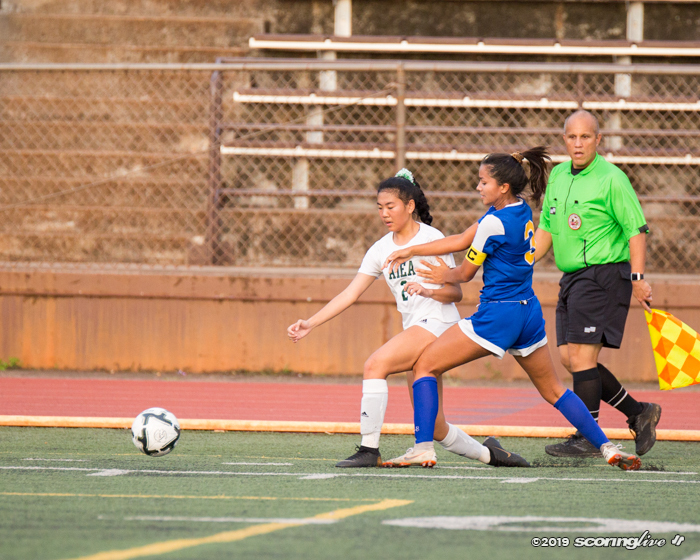 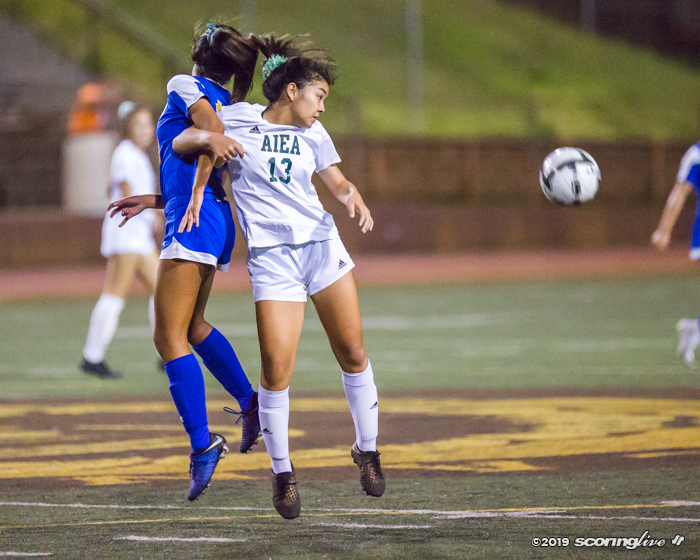 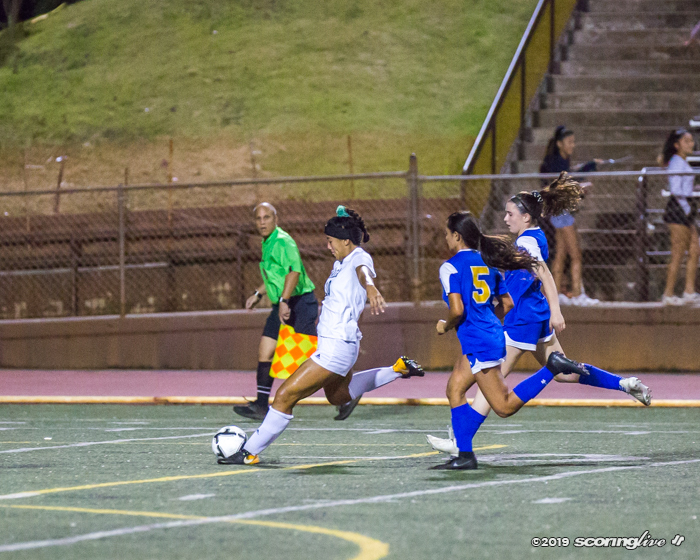 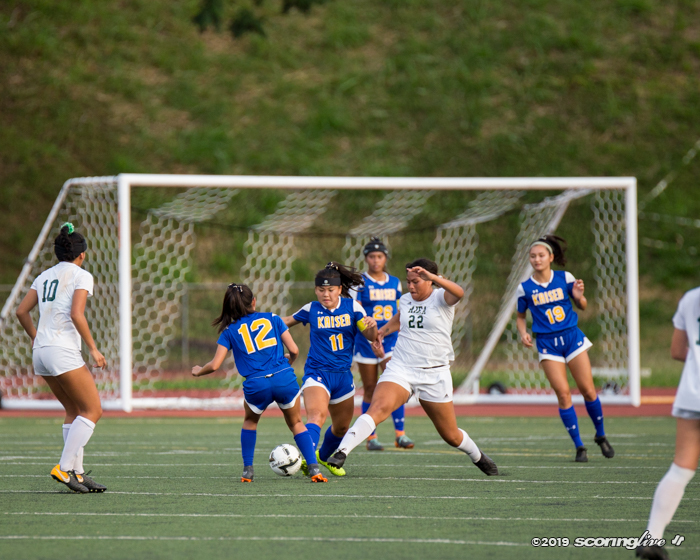 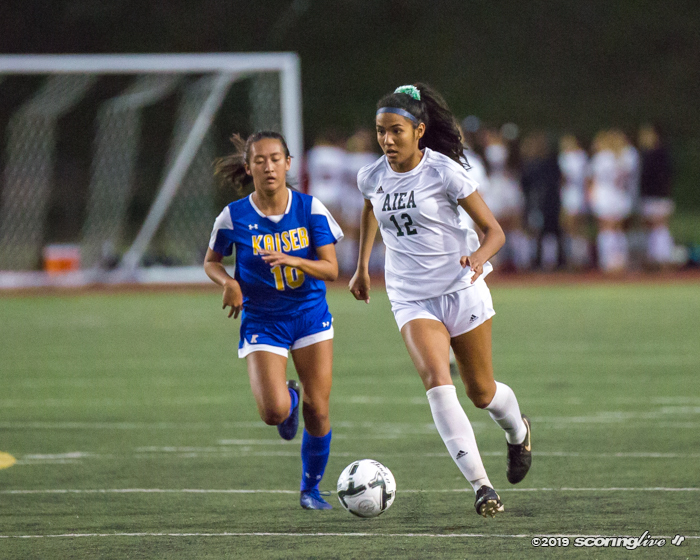 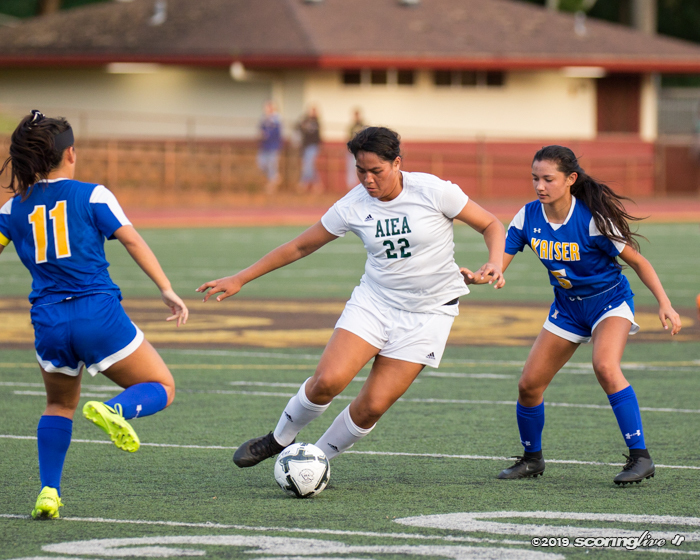 The score remained tied until the 78th minute, when Aiea benefitted from a similar counterattack. 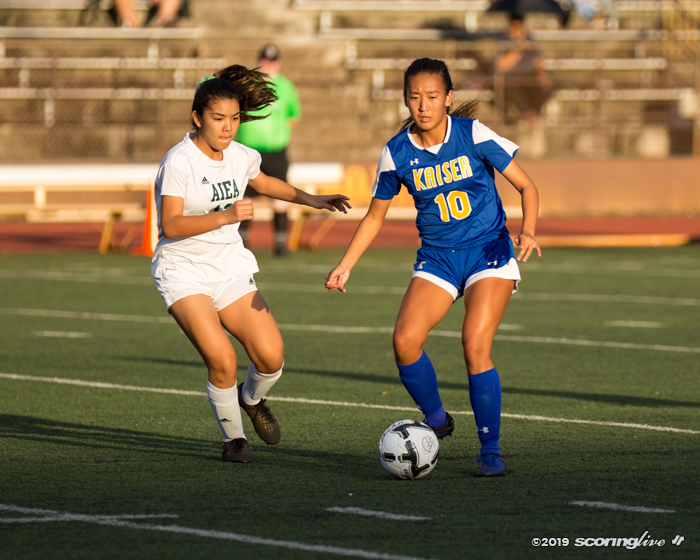 Olanda cleared a pass in the back third up to a streaking Miranda, who gathered the pass and fended off a defender before firing a right-footed shot into the lower left corner of the goal despite a tough angle. 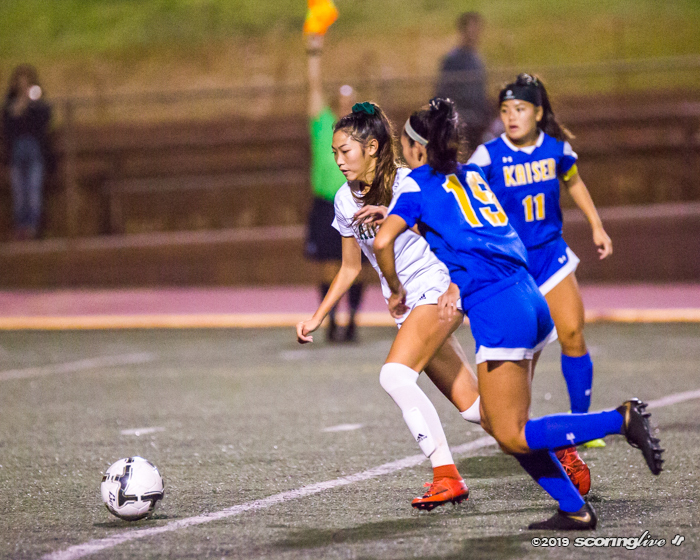 "The defense kicked it out to try and get it over and they did and I saw an opportunity to take it down again and it went in," said Miranda, who also scored a goal in the win over Kahuku Monday. 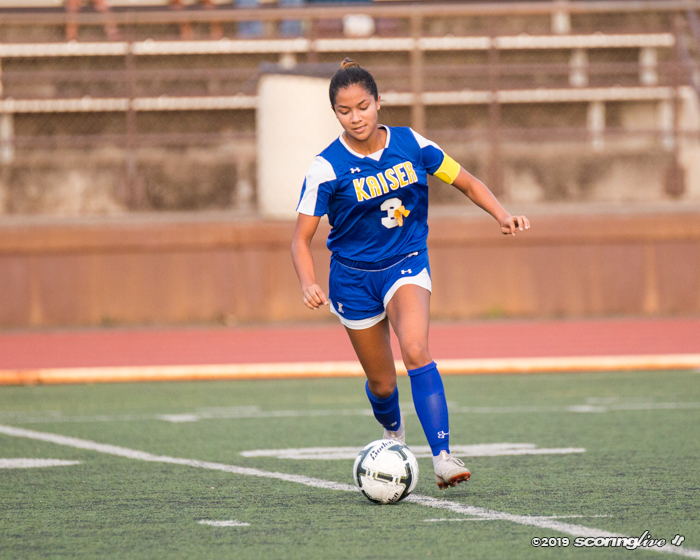 Miranda noted that some familiarity with the defender, Kaiser's Alyssa Gabriel, played to her benefit on the winning goal. 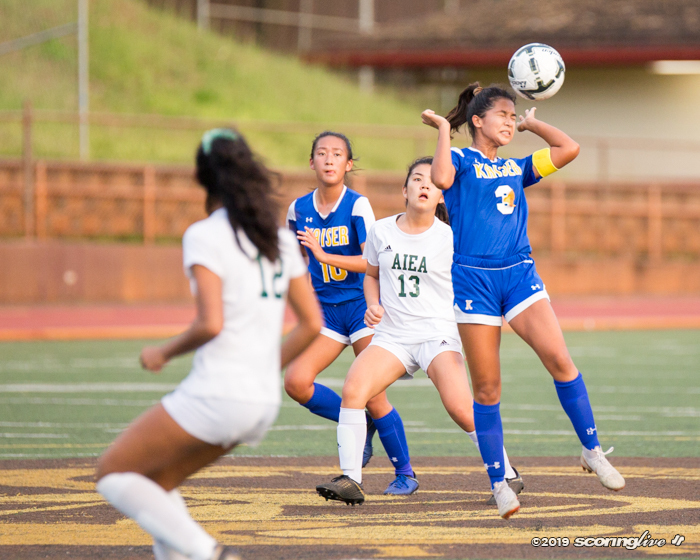 "I play club (Leahi) with her so I kind of know what kind of defensive player she is, so I just knew she would go for one of my moves and then I just touched it to the side and shot it," Miranda said. 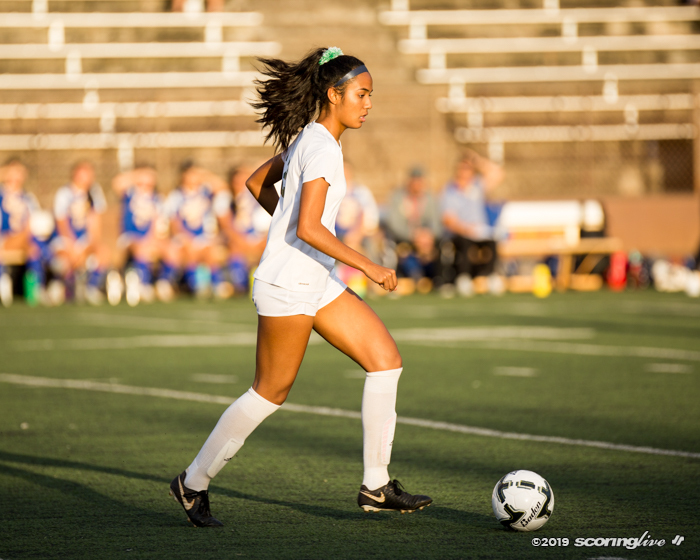 It was Miranda's eighth and ninth goals of the season. 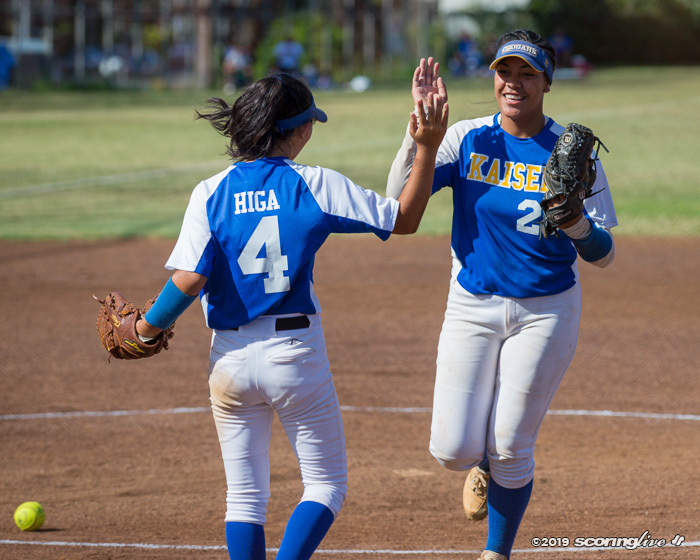 Villaflor expressed his happiness for Miranda, who missed a significant amount of time due to a past knee injury. 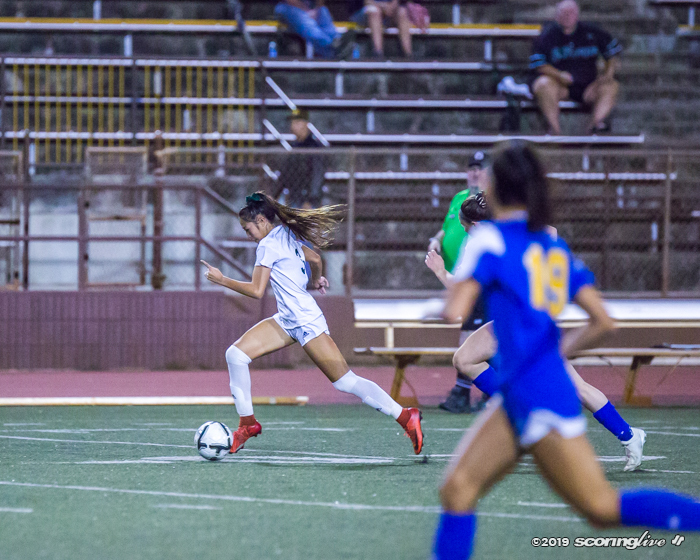 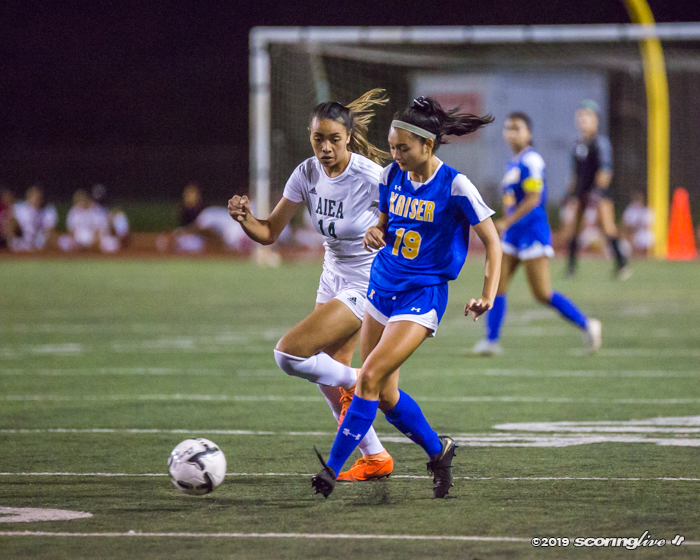 "Savannah was out with an ACL injury for a year and a half, so she kind of fell off the radar, but now that she's back, she's rehabbed, so she's definitely one of our key players and she was amazing tonight," Villaflor said. 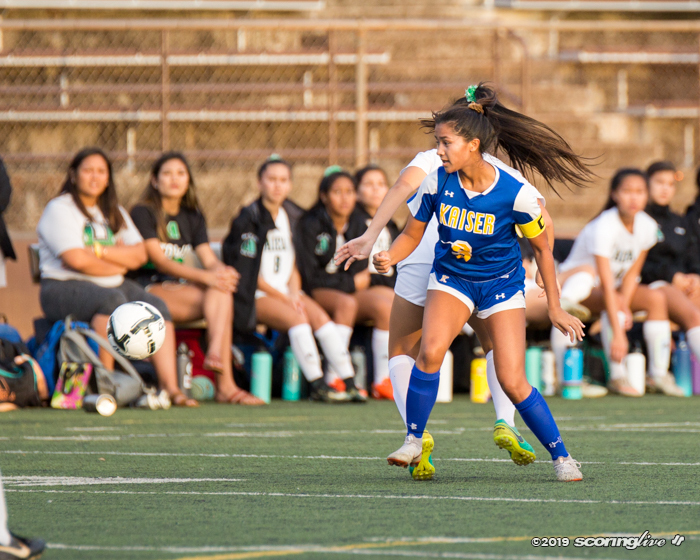 Kaiser coach Noelani Bio was hardly discouraged by the result. 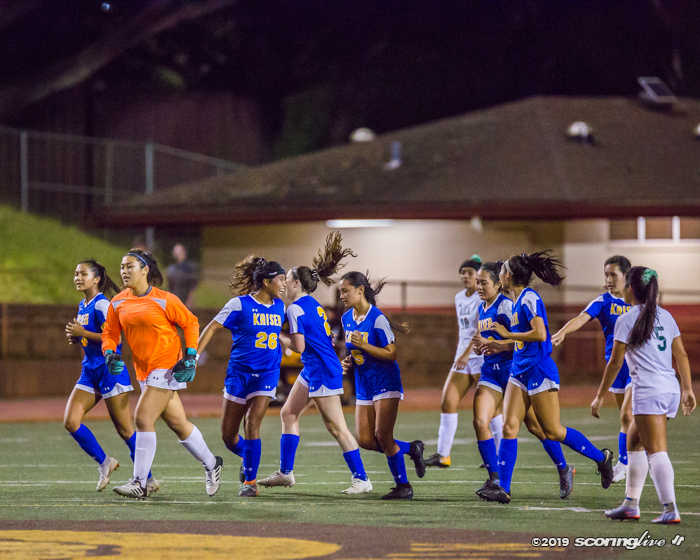 "It's definitely not over for us. 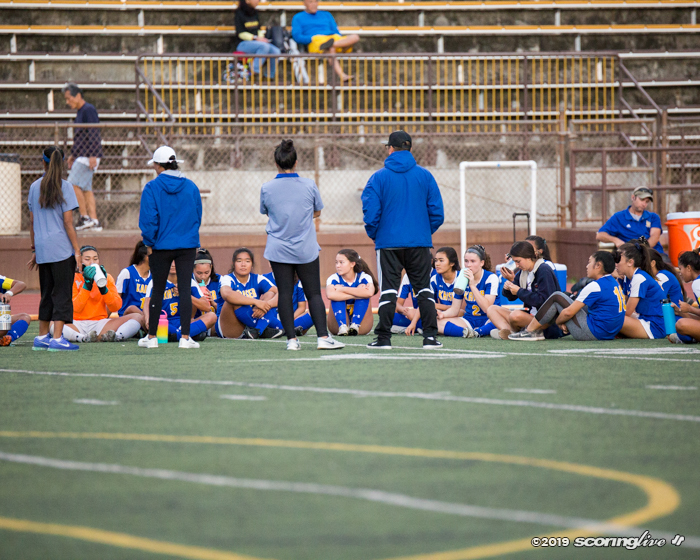 We're definitely gonna look to win (Wednesday) and then try to take it from there. 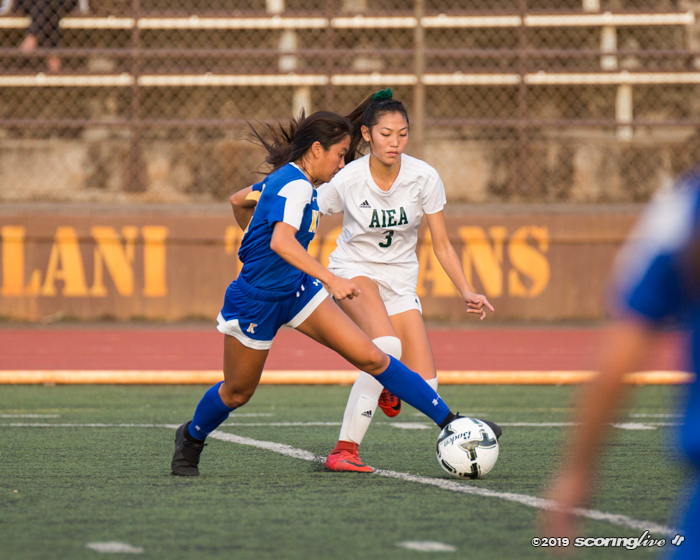 We gotta go the long way now, but it was a good game for us," said Bio, whose team was coming off a first-round bye Monday. 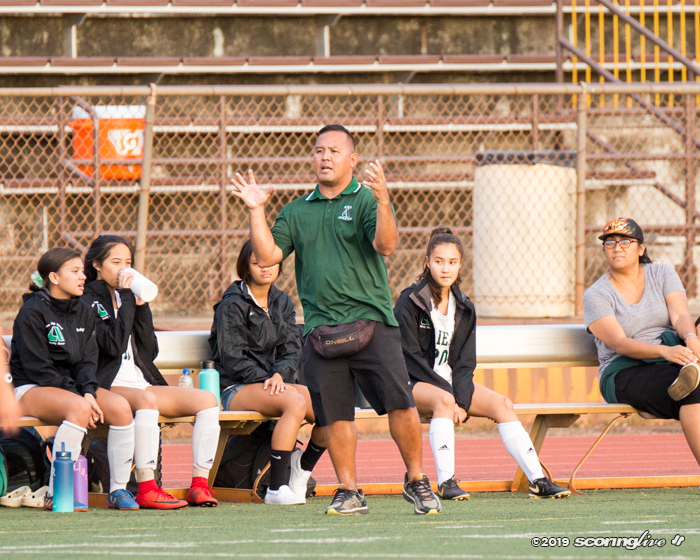 "I think we outplayed them, we out-possessed them, they just made their opportunities count and they got the score when they needed it. 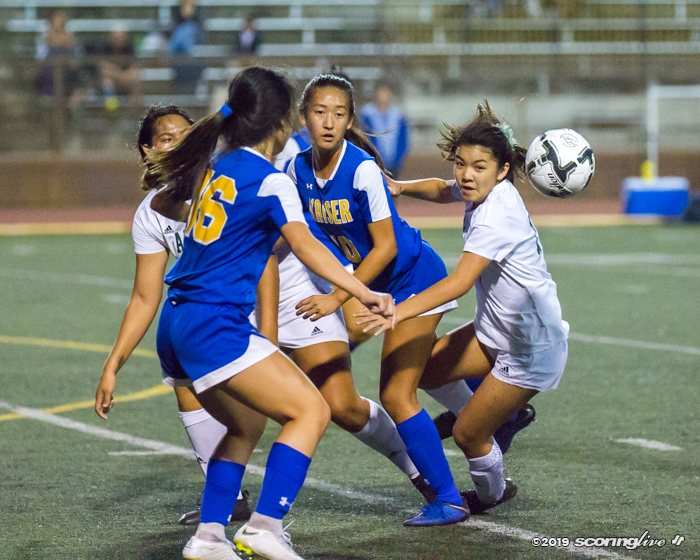 It was a really good matchup. 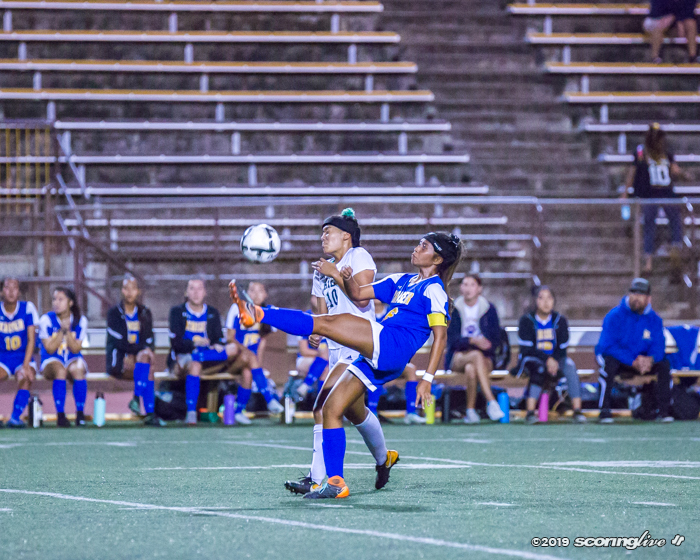 I thought we played really well against them. 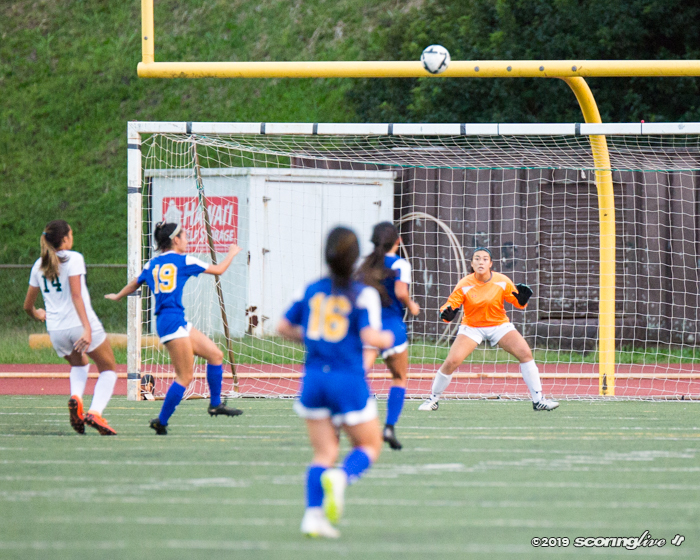 We had it, we just couldn't put it in the back of the net when we needed it," Bio said.